We’re still in the cloudy, rainy weather conditions we have been experiencing, for what seems like forever, but today was set to be cloudy and dry with lighter winds than of late. 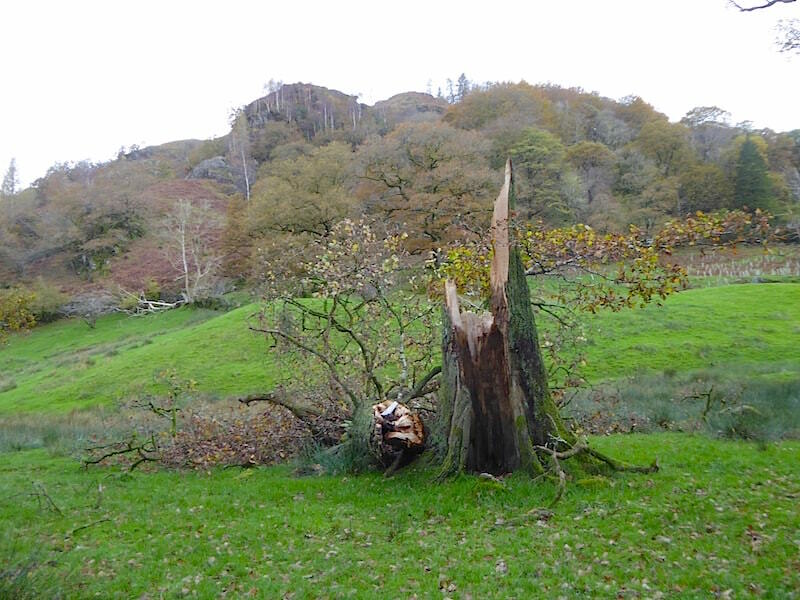 It was going to be the best day of the week ‘they’ said so we pulled today’s walk out of the pending tray in the hope that the recent storms wouldn’t have reduced all the deciduous trees to leafless skeletons, and that we might get some decent views of colourful autumnal trees. 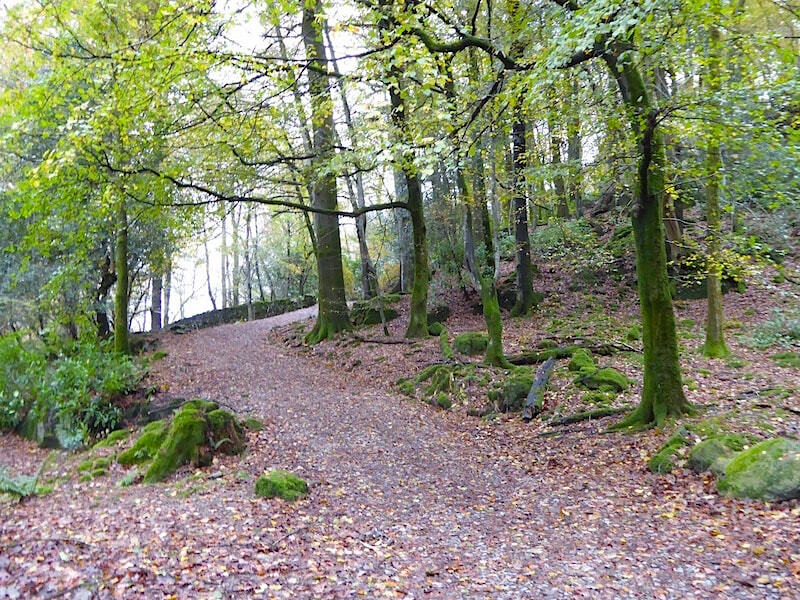 We had planned to do this walk towards the end of September but decided to wait a while longer until everything was in its full autumn colour. Things didn’t quite turn out that way and many trees had lost much of their foliage but enough remained to put on a bit of a show, although longer spells of sunshine and brighter light would have helped to show what did remain to greater advantage. 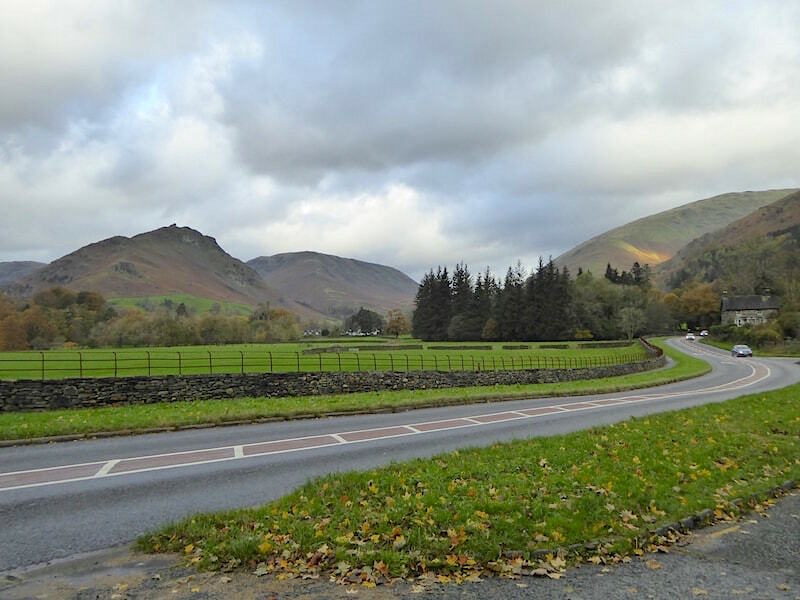 Cloudy skies and low light over Helm Crag and Steel Fell, on the left, and Seat Sandal on the right, from the lay-by on the A591 just outside Grasmere where we’d parked up. Its half term week so its likely to be busy in the village, especially today as no rain appeared anywhere in the forecast. Once we’re kitted up and ready to go we turn left out of the lay-by and walk the short distance down to the roundabout at the entrance to the village. 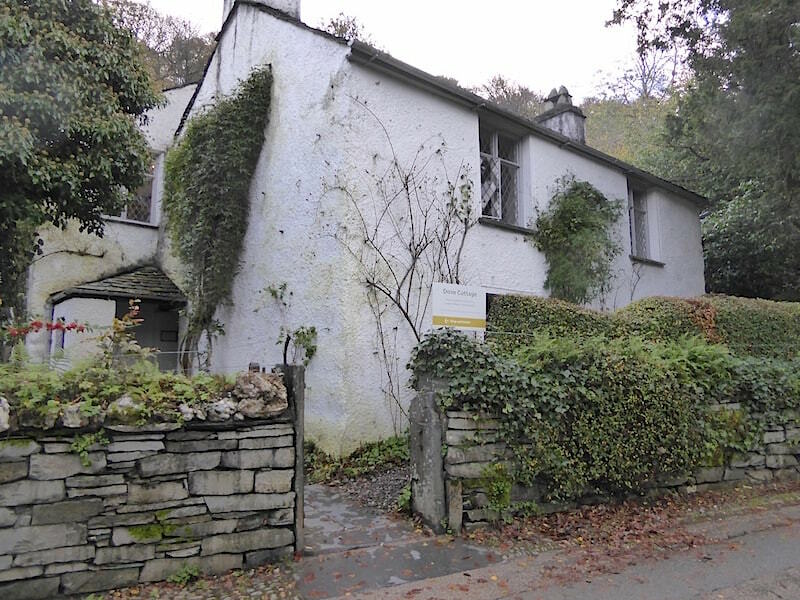 At the roundabout we veer off to the left and follow the little lane leading from the Wordsworth Museum up to Dove Cottage, once the home of William Wordsworth. There were a couple of Japanese tourists busily taking photographs but that was all, apart from us of course. 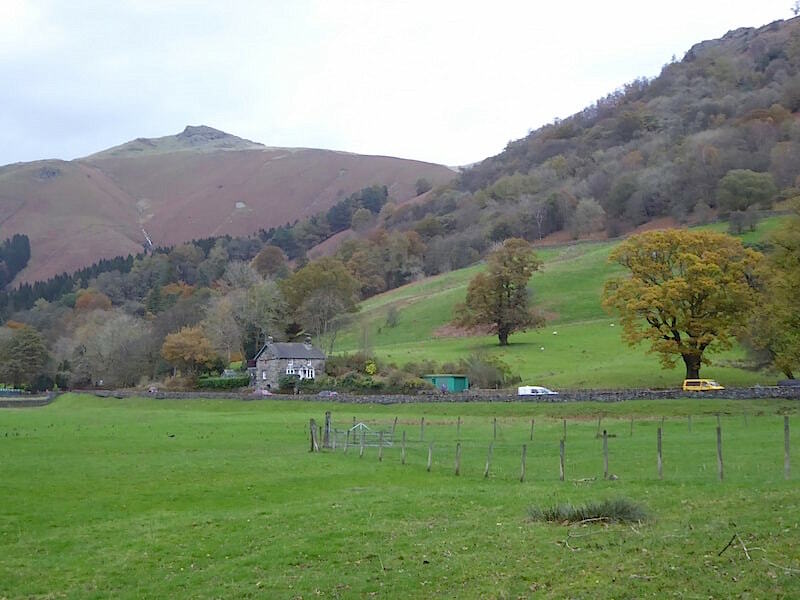 No-one around as we walk up the lane and we aren’t extra early, its getting on for 10.00 am, perhaps all the visitors are still having breakfast in Grasmere or waiting for the day to warm up a bit and banish the damp, clammy atmosphere. 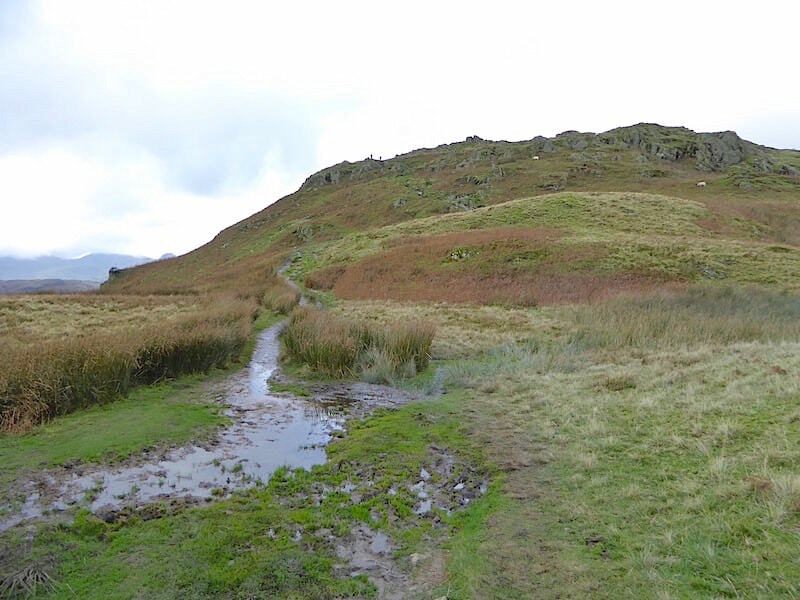 Up at the junction we’ll take the left hand turn, the right hand turn takes a very nice but fairly level route across White Moss Common and comes to an end at Rydal Mount. 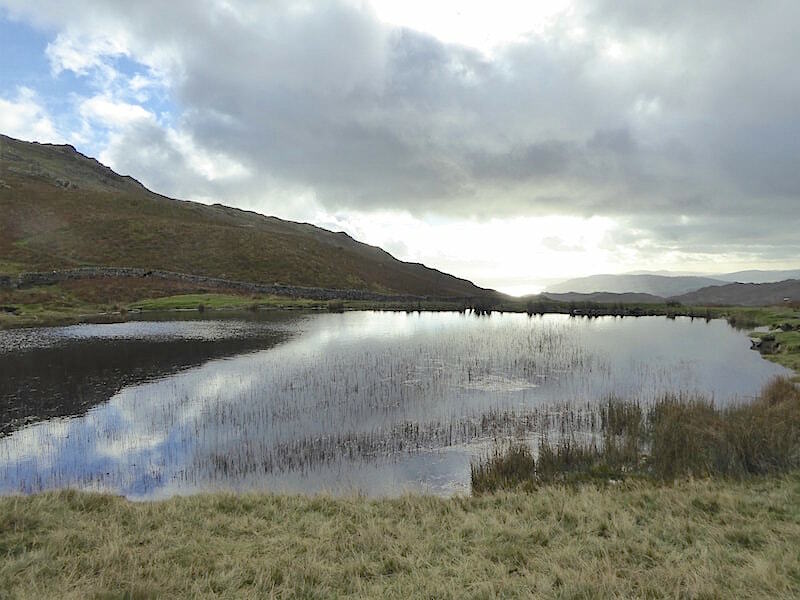 We’ll be at Rydal Mount later on but we’re taking the hill climbing route via Alcock Tarn and Nab Scar to get there. 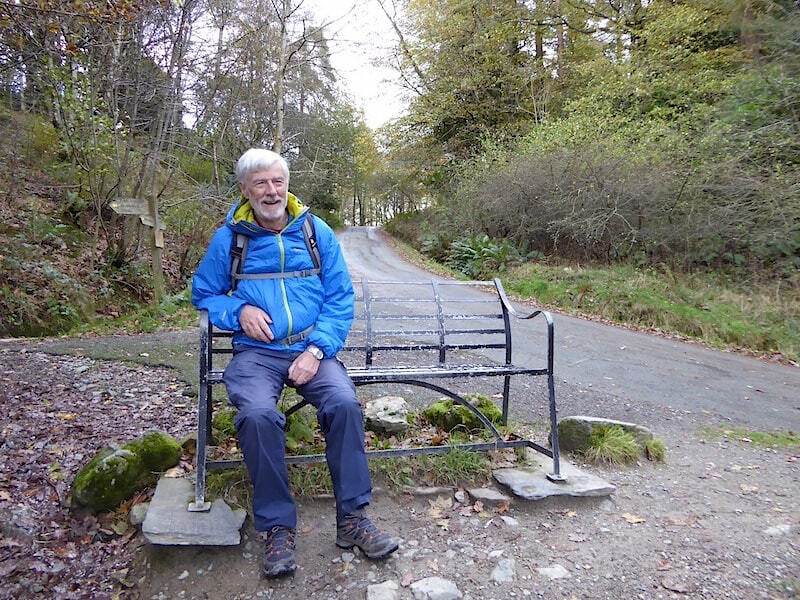 A little way up the road we reach the viewpoint bench at the junction …..
….. where you have to make use of it, just because its there. 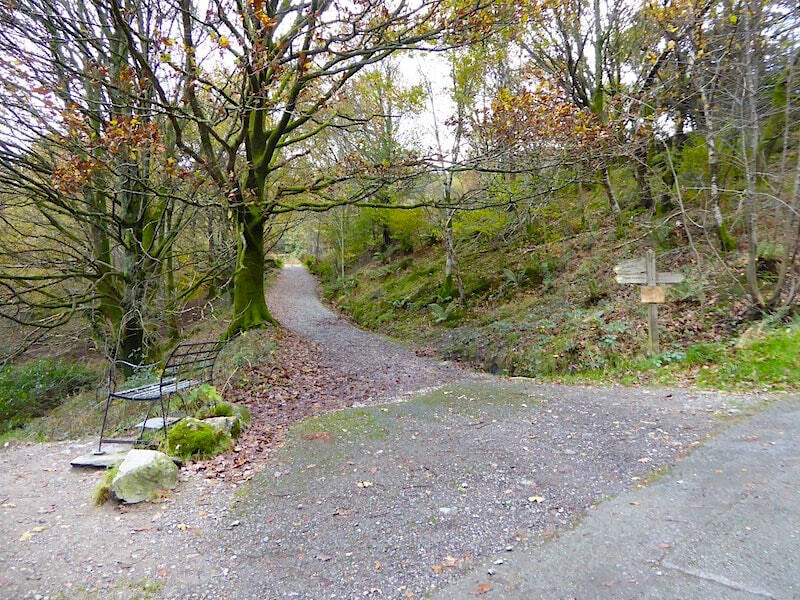 Having paid our respects to the bench we carry on along this path through Brackenfell Woods …..
….. and enjoy a lovely walk along the gently graded path where many of the remaining leaves are still surprisingly green. 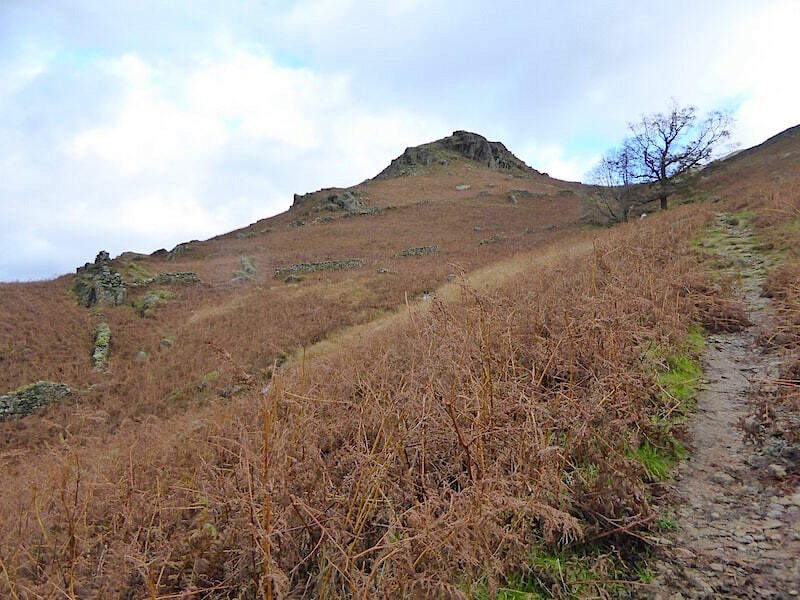 A right turn at the waymark where the path now begins to climb a little more steeply …..
….. and a look back down our route from the same waymark. Alongside the path a little further along is this old fish pond, obviously man made but I haven’t been able to find out very much about it other than this area seems once to have been someone’s landscaped woodland garden, quite possibly created for a well heeled Victorian family to stroll around in. 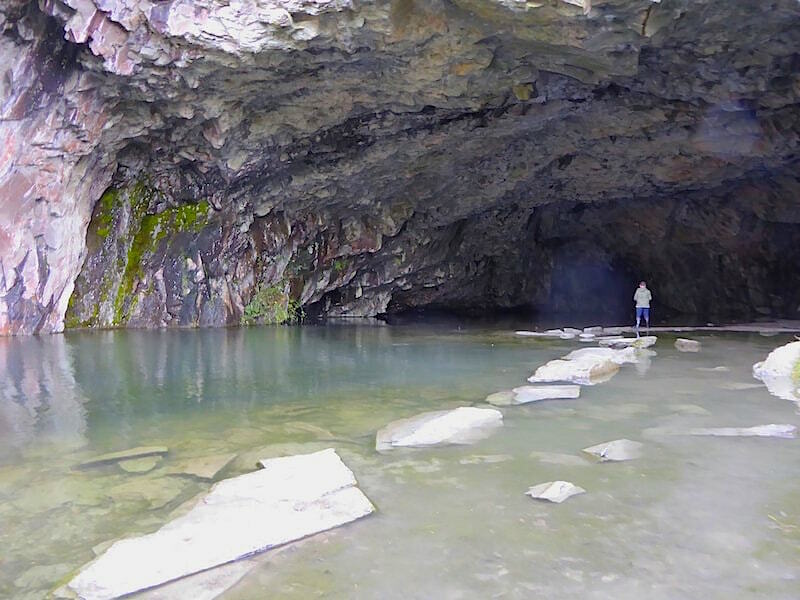 Its a pleasant little spot to explore for a few minutes …..
….. but despite a lot of peering down we failed to see anything resembling fish moving about in it, no doubt there will be a myriad of other water loving creatures in there who regard it as home. 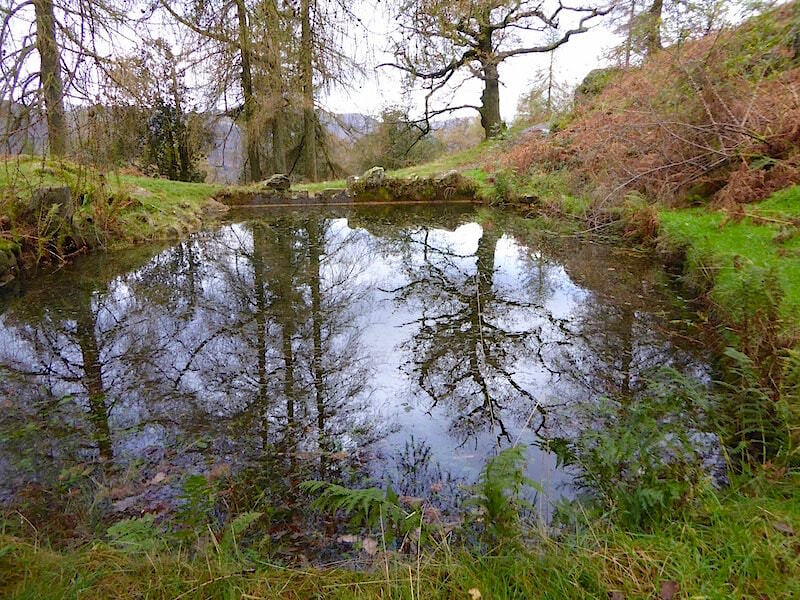 The path from the fish pond winds up, around and above it …..
….. and leads us on to another bench viewpoint. 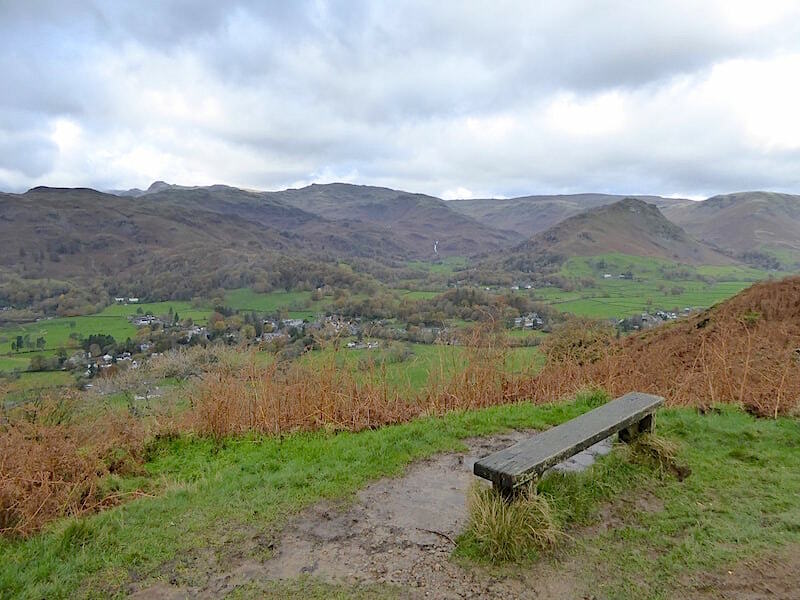 The invitation to view the scene from the bench was declined because it was far too wet to sit on …..
….. so here’s the standing up view of Helm Crag and Steel Fell instead. The view ahead as the path begins to steepen once again, but at least its not waterlogged so there was no cursing about not being able to gain a decent foothold. Walking on a reasonably dry path again was something of a novel experience given what we have walked through lately. 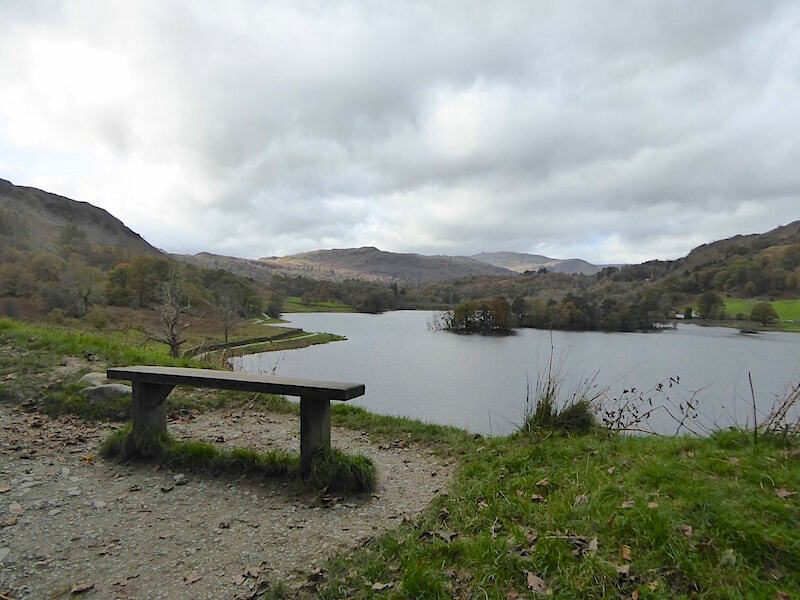 After a bit of an uphill stretch we arrive at another waterlogged viewpoint bench where, on a better day, it would have been very pleasant to spend a couple of minutes taking in the extensive view. It all looks rather dreary, dismal and cheerless at the moment although it isn’t as cold as it might appear from the shot. Towards the centre you might be able to pick out the thin white vertical line of Sour Milk Gill flowing down into Easedale, with the prominent tops of the Langdale Pikes appearing on the left skyline. 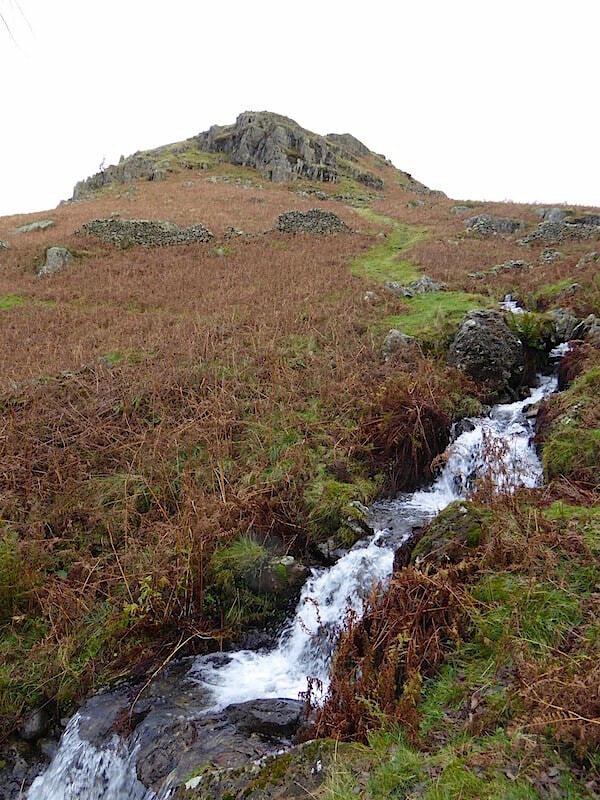 The path continues to climb a little more steeply and across the wastes of dead bracken Grey Crag comes into view and the sound of rushing water fills our ears …..
….. and eventually the path takes us up alongside the beck which was cascading and crashing hell for leather out of Alcock Tarn. 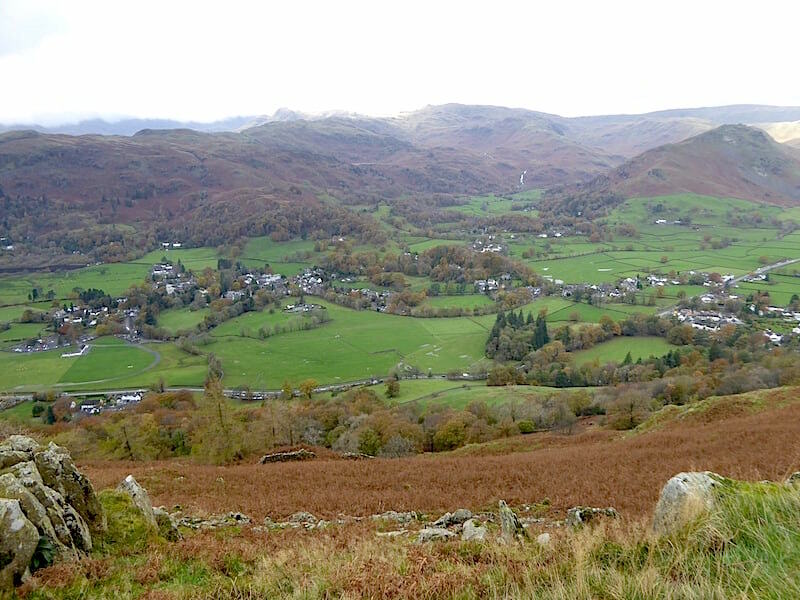 Reaching a flatter area just below Grey Crag we pause for a breather and take in the view of Grasmere village below us. Sadly the long distance views weren’t up to much since considerable amounts of low cloud were obscuring many of the fell tops today. 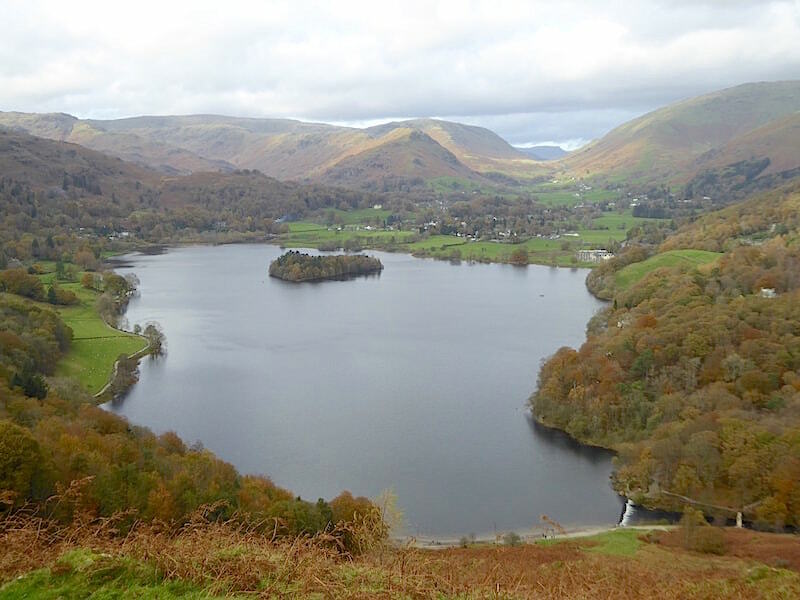 A little further along and we have a view of Grasmere water with its single island, known simply as The Island. 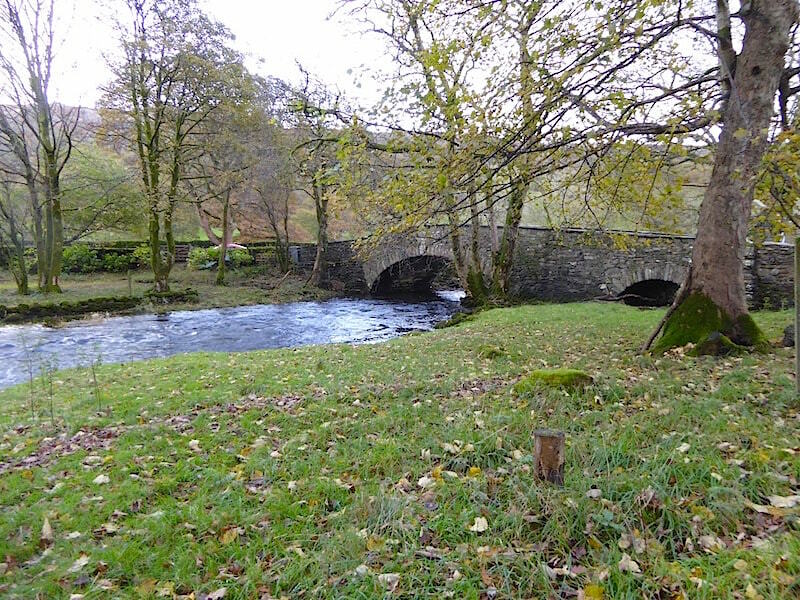 Rowing boats can be hired in the village and privately owned rowing boats and canoes are also allowed but powered boats are prohibited. That’s put the tin hat on my water ski-ing plans then. 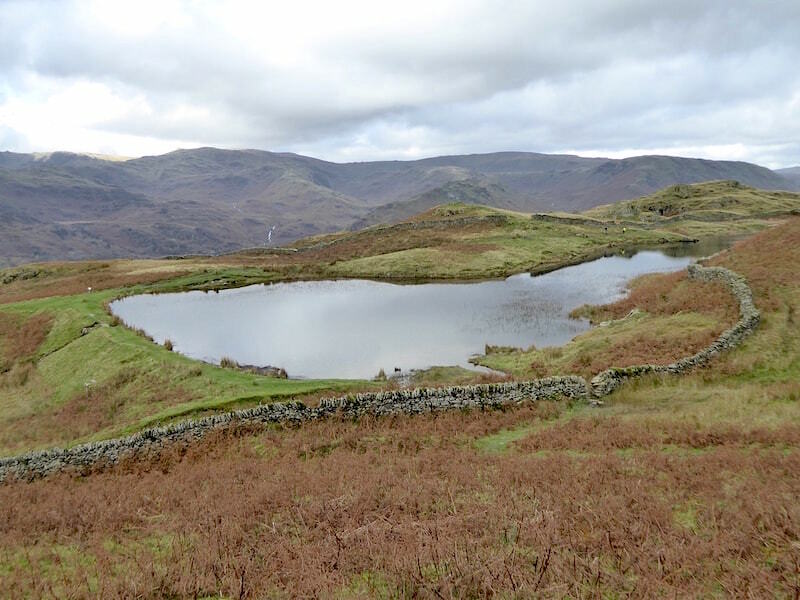 Looking across the sheepfold on our right to the skyline where we will be heading after we have visited Alcock Tarn. 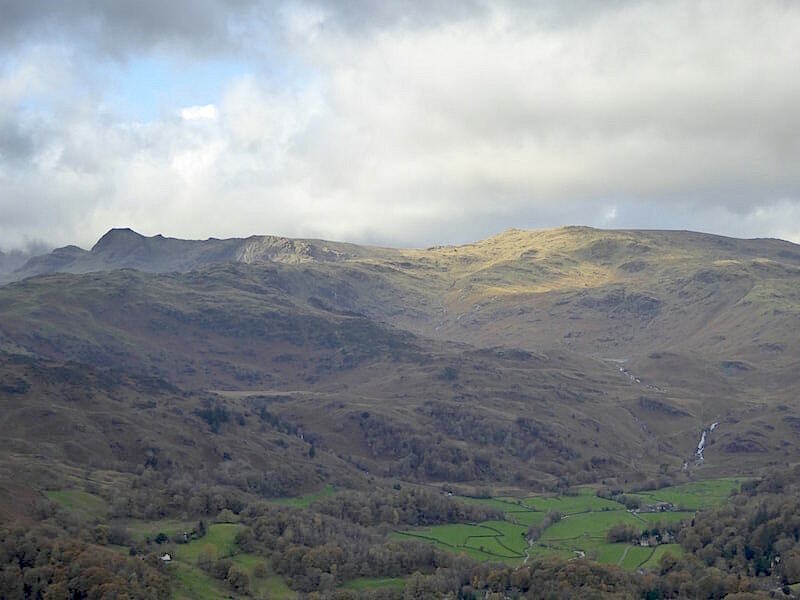 This is the western arm of the Fairfield Horseshoe which rises from Rydal Mount up Nab Scar, and on across Heron Pike, Great Rigg and on to Fairfield at the head of the horseshoe. 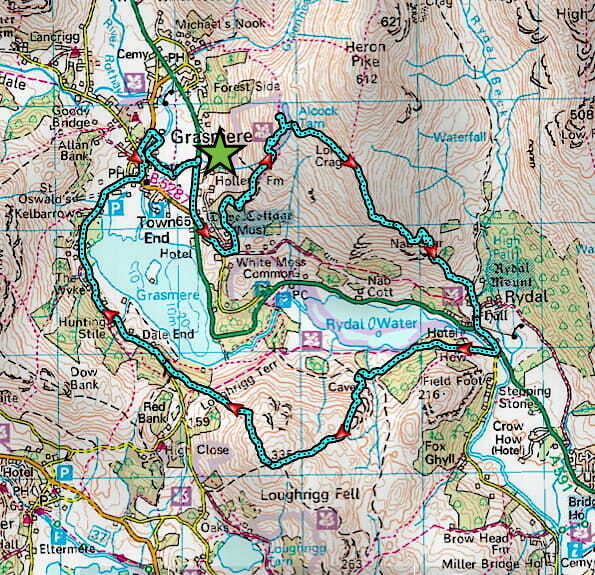 Behind Grey Crag and just a few paces further along we reach Alcock Tarn. 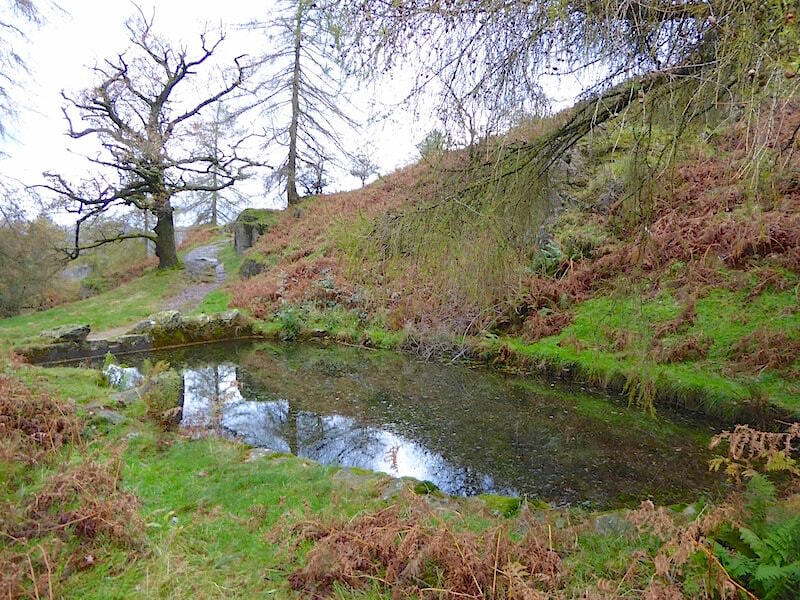 This little gem of a tarn is perched on a grassy shelf about 1000′ above Grasmere and the A591. 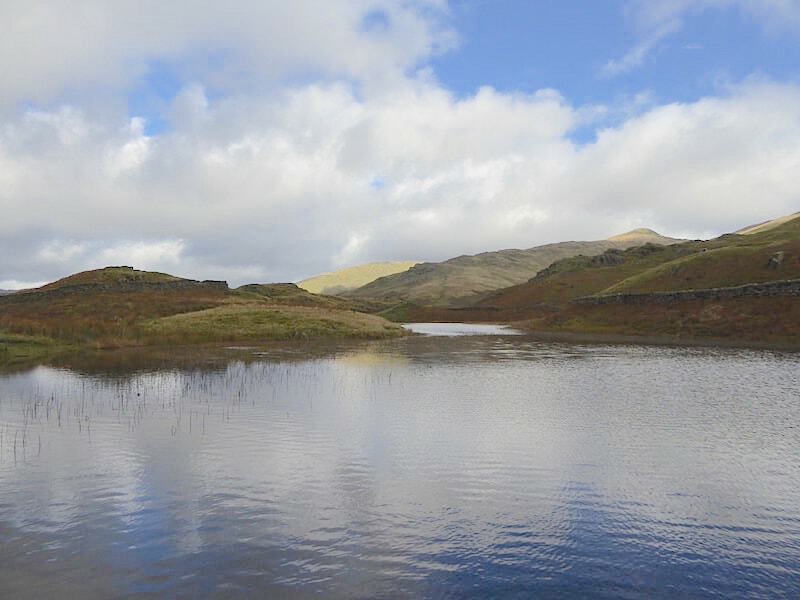 It was originally named Butter Crag Tarn until late on in the 19th century when Mr Alcock, of Hollens Farm in Grasmere, enlarged it by creating a stone and earth dam at its southern end to create a trout lake …..
….. and there, over on the right of the tarn is Butter Crag with Stone Arthur rising up to Great Rigg on the skyline behind it. 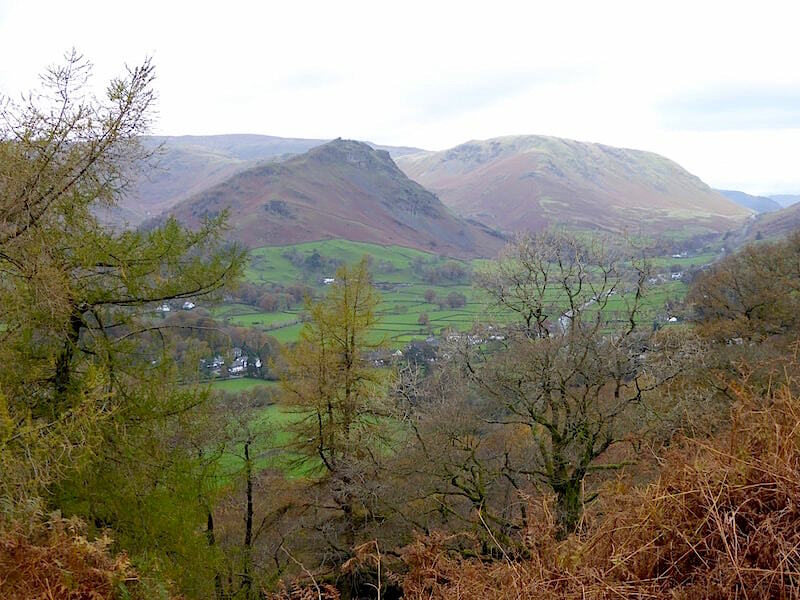 I went through a gap in the wall on the left up to the higher ground beyond it …..
….. for this view across the vale of Grasmere with the Langdale Pikes on the left and Sergeant Man in the sunshine on the right. 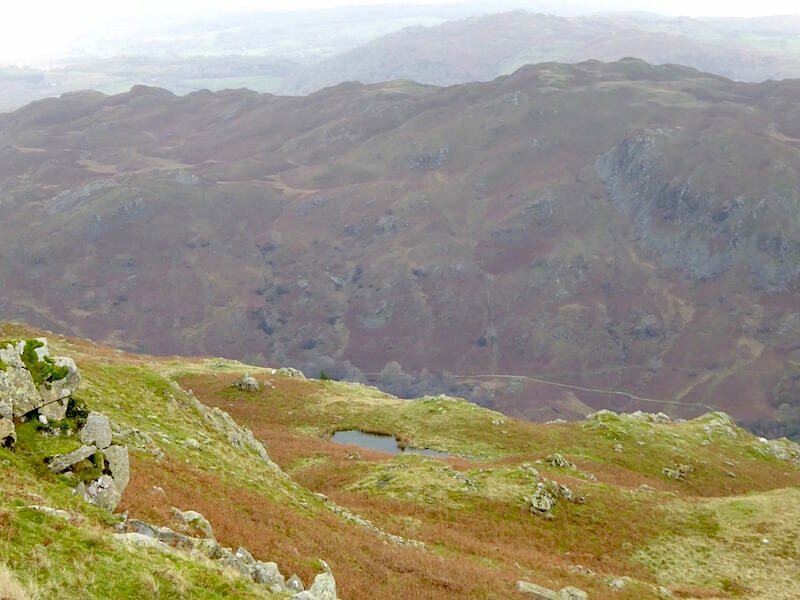 If you zoom in close enough on the Pikes you may be able to pick out the route of Jack’s Rake on Pavey Ark, which is just visible in the last of the sunlit area. 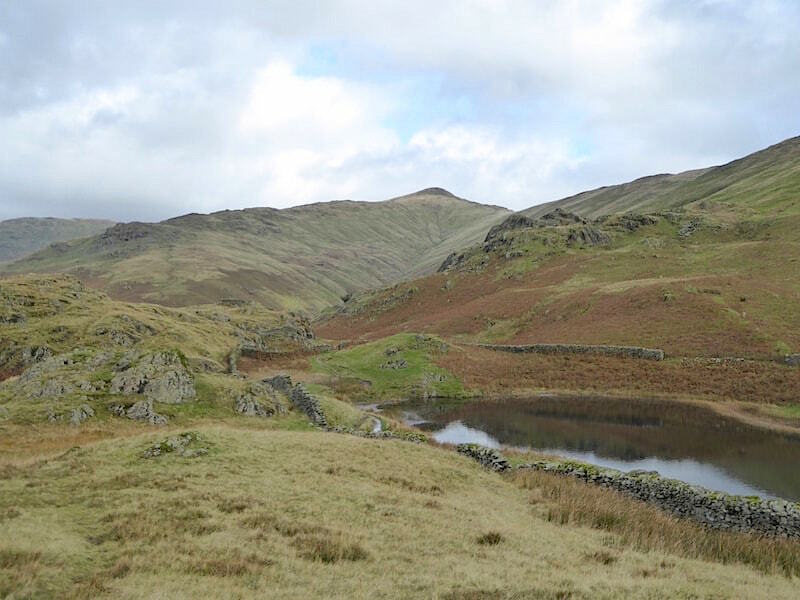 Over to the right Sour Milk Gill is clearer now and above it part of Easedale Tarn is beginning to come into view. An executive decision decreed that it was an ideal little spot for a Mars Bar break so while it was being tucked into I wandered around to take a couple more shots of our surroundings …..
….. Grasmere water and the wooded slopes of Hunting Stile, beyond which is a very hazy view of Coniston Old Man …..
….. and a view looking south across Alcock Tarn. As you can see we were under cloud (aren’t we always?) but beyond it the sun was casting a dazzling glow over Lake Windermere and creating such a glistening silver sheen on it that it was impossible to view it for more than a second or two. 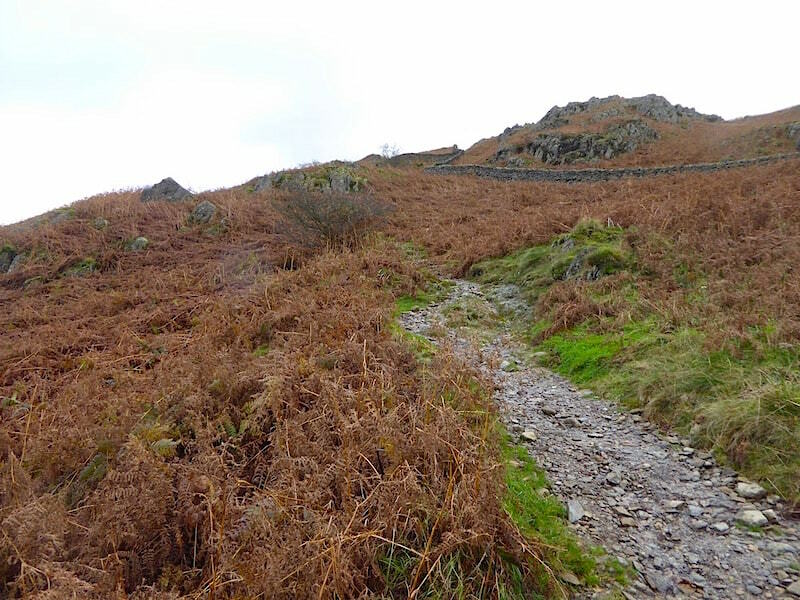 The Mars Bar break comes to an end and on we go, through the wall and pick up the grassy path through the bracken which will lead us over a rising traverse up to the ridge line. 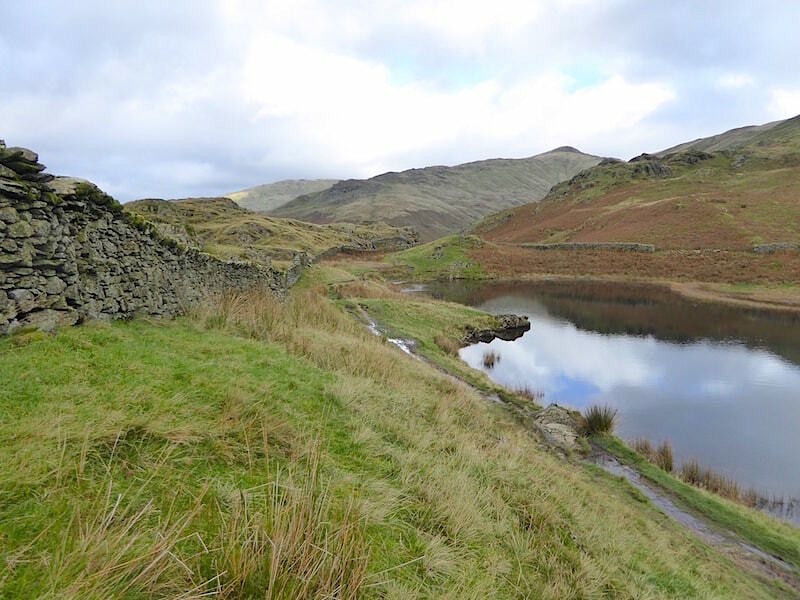 Before we lose sight of it I took a look back at Alcock Tarn from the path and notice two more walkers just arriving alongside the wall on the opposite bank. As you may have noticed it wasn’t exactly crowded up here today, apart from us and those two we saw one solo walker, who had earlier come down the path we are now on, he walked straight past the tarn without a second look and carried on straight back down, and a couple who we caught sight of some way below us as we reached Grey Crag. A look back as we progress along the path, it was wet but not unduly muddy. Patches of blue sky kept appearing here and there, but a few brief seconds of sunshine never managed to land on us as we made our way over. A small outcrop to negotiate along the route but nothing steep or scary to worry about, it was all about avoiding the muddy, slippery bits. 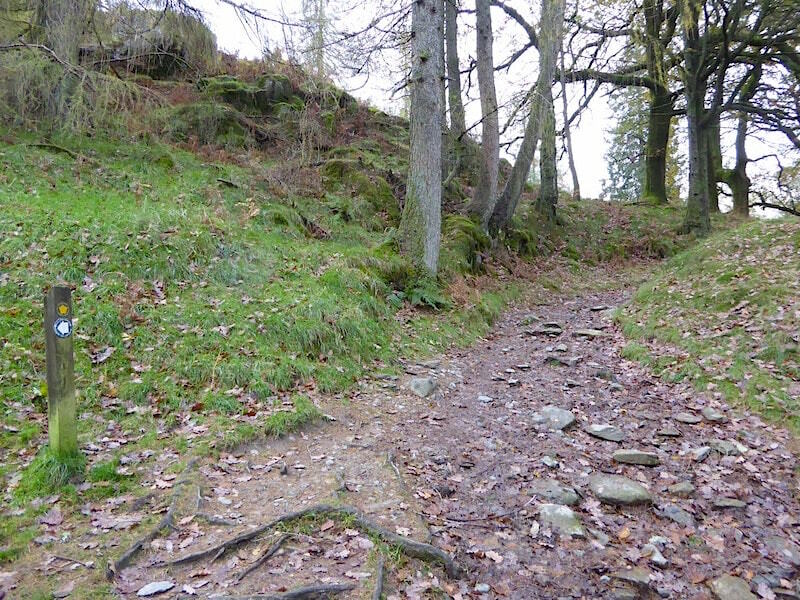 The path follows this natural course over the outcrop so of course everyone uses it and consequently it can become very claggy after a lot of rain, and there’s been no shortage of that of late. 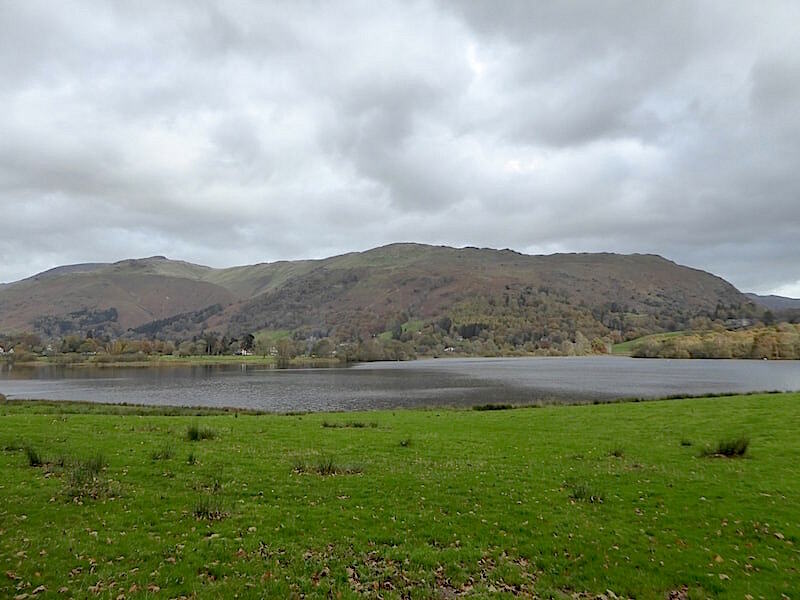 A quick look across Grasmere to see if things have brightened up at all, and no they haven’t. 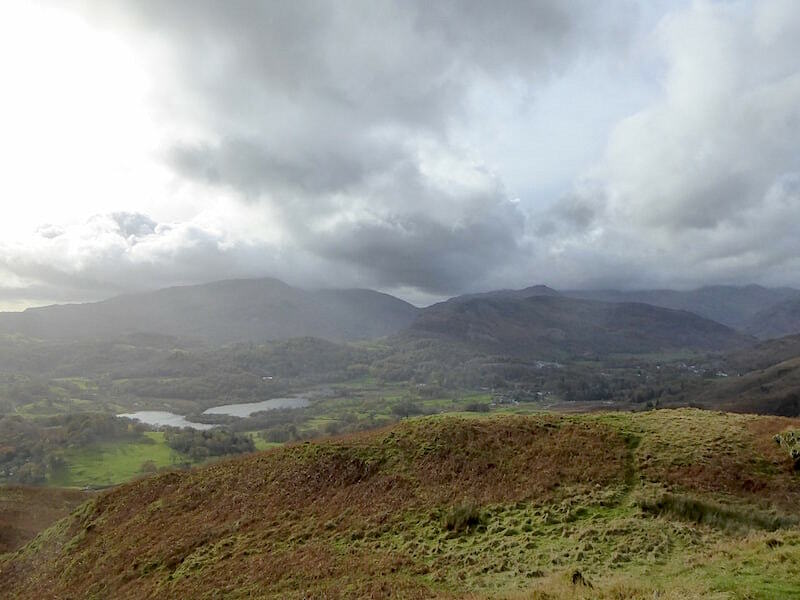 If anything the clouds are boiling up and spilling out of some cauldron or other over the Coniston fells to the west of us. 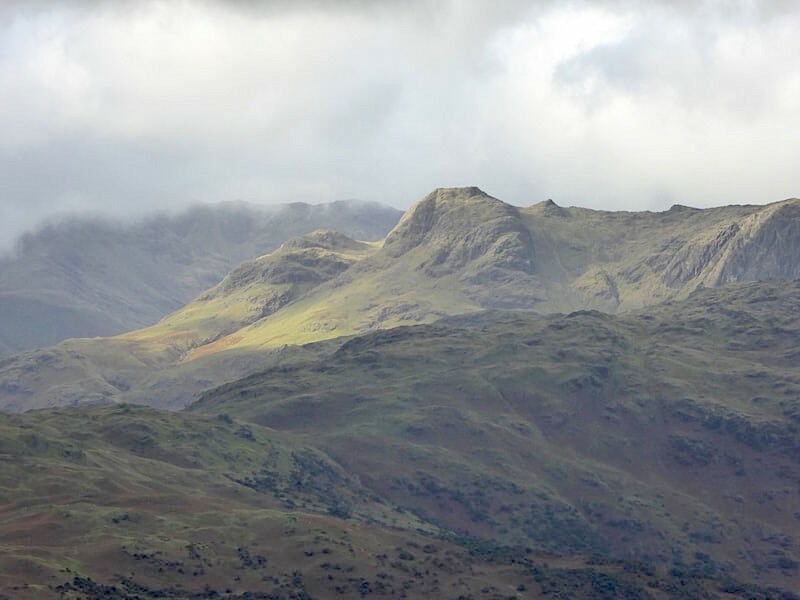 The Langdale Pikes suddenly become illuminated …..
….. so an opportunity for a quick shot of them before the ten seconds worth of sunshine drifts away again. They’re always an impressive sight. 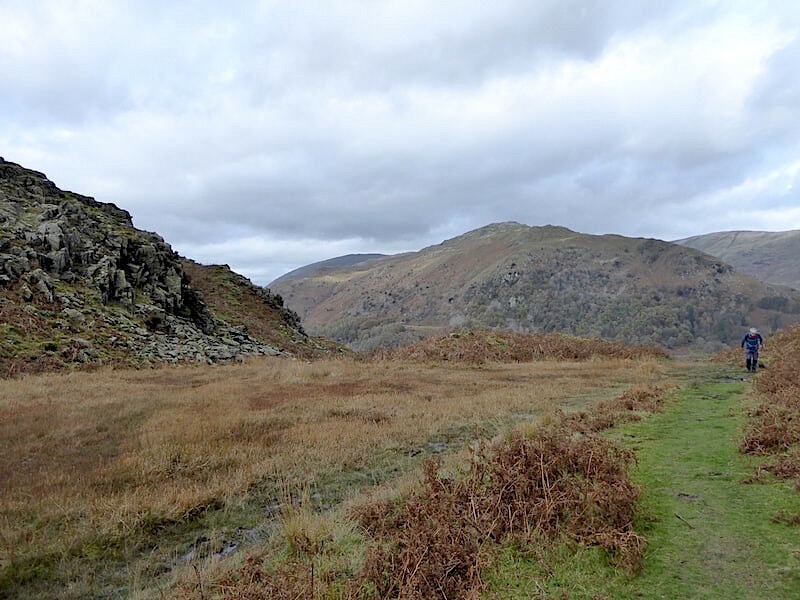 Not much further to go now, so its one last pull up to the ridge line …..
….. with a view down to Dockey Tarn and, over to the right, of the steep face of Ewe Crag on Loughrigg. 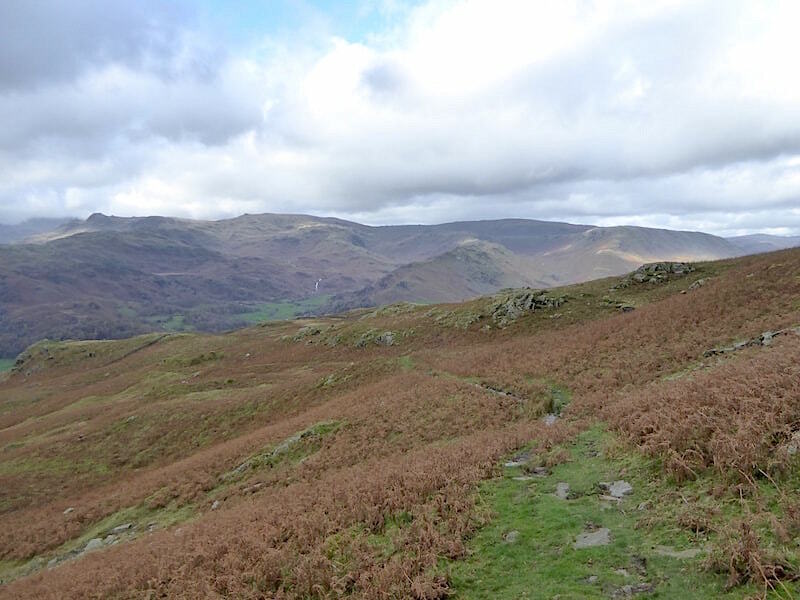 And here we are on the ridge where our path joins the Fairfield Horseshoe one. 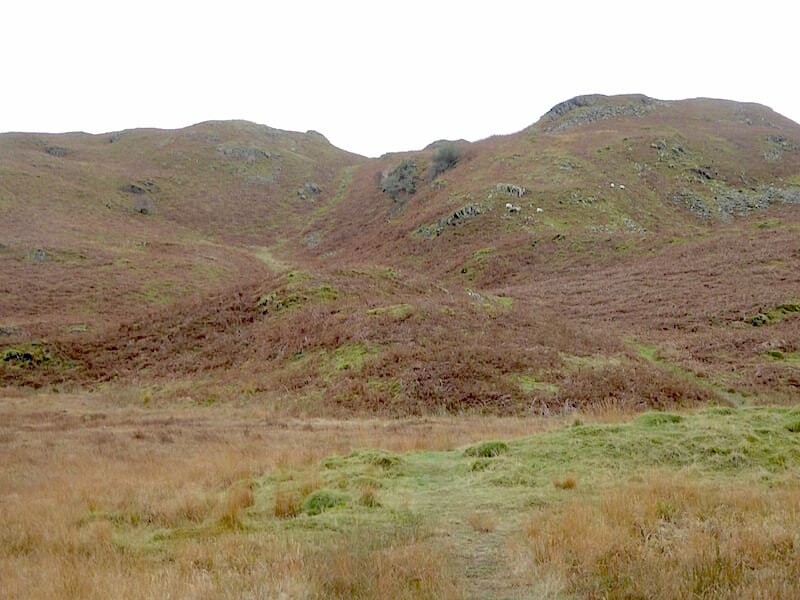 The cairn atop the little hillock on the right marks the top of Nab Scar, the first summit of the horseshoe for walkers starting out from Rydal Mount. As we approached a group had just passed by heading off left of the shot on their way to Heron Pike and just after taking it a pair of walkers came along going in the same direction. 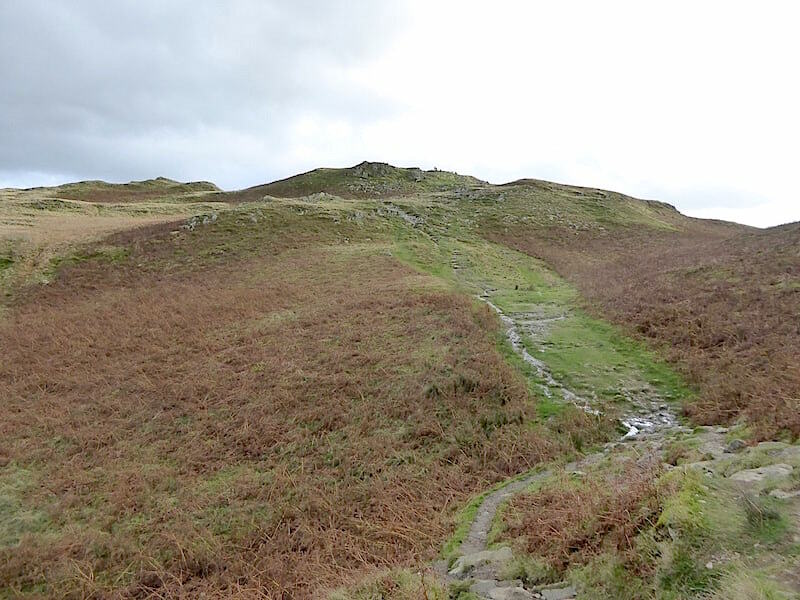 Hmm, it could be busy as we descend Nab Scar I thought. 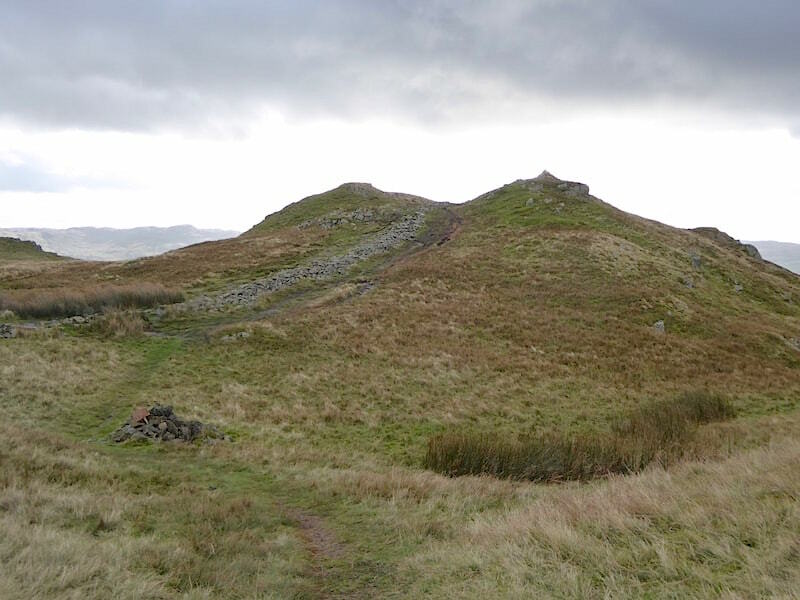 This is the direction in which they were all heading, passing by Lord Crag, the lump of rock over on the left, on their way to Heron Pike, the summit of which is out of shot a good way beyond the high point on the skyline. 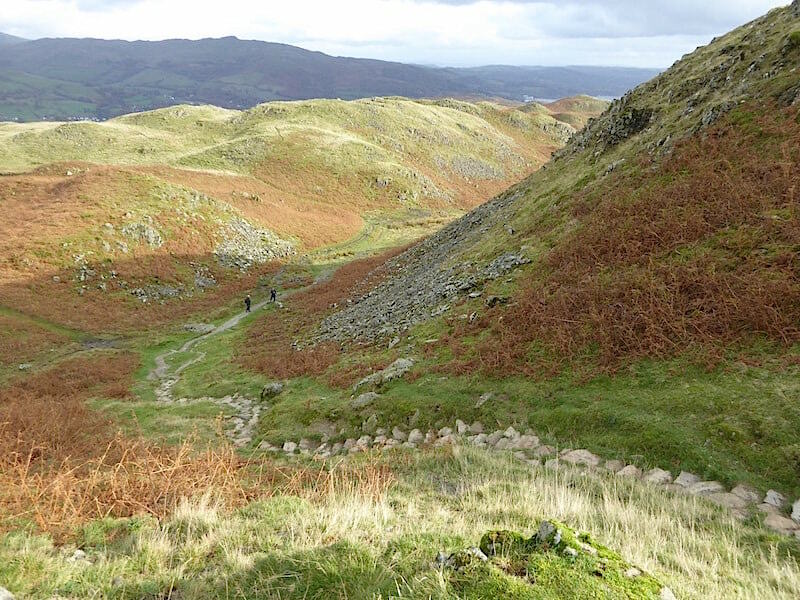 We turn our backs on the Heron Pike path and make our way across Nab Scar. 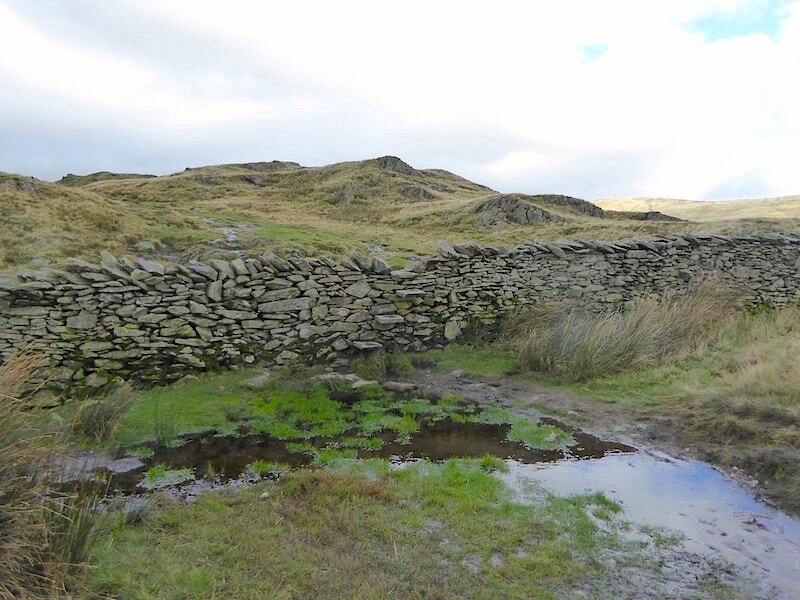 At the wall both sides of the step stile were waterlogged but over to the left of the shot was a break in the wall, the ground was marginally less boggy over there so that took care of that little dilemma. Once back on terra firma I took a look back at nature’s manifestation of a water feature. 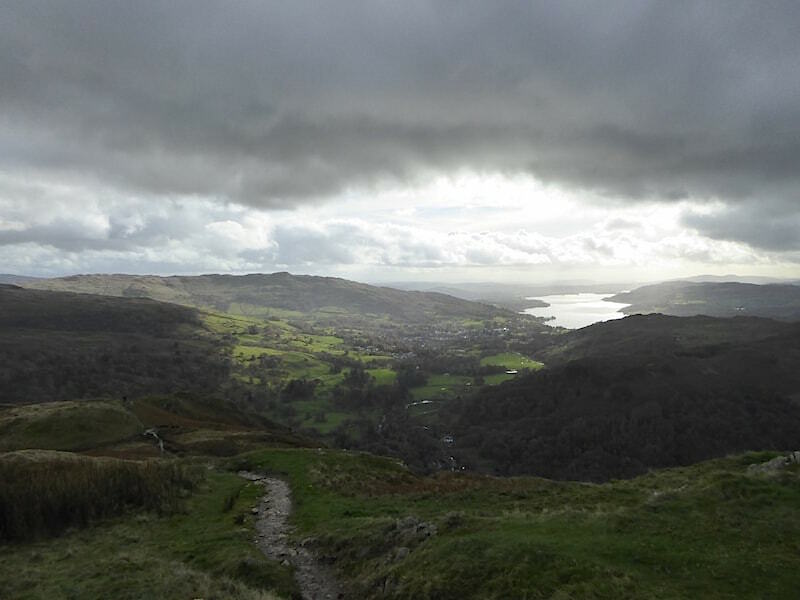 Windermere was still shimmering beneath the sun while we shivered beneath that mass of ugly and ominous grey cloud. There isn’t much to provide any sort of a wind break between it and us so it was quite nippy in the strong breeze and under that cloud up here. 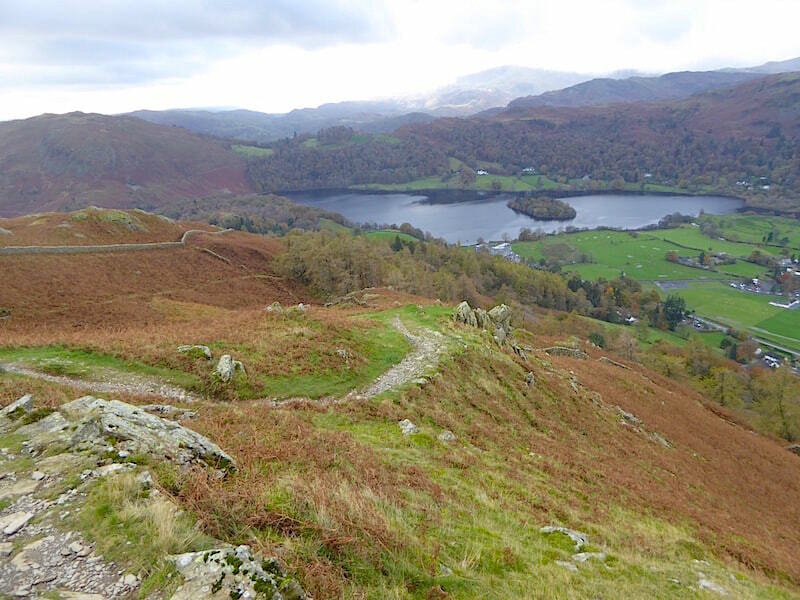 Other than the path immediately below us, and Lake Windermere with Wansfell to the left of it there isn’t a whole lot else I can identify at the moment. 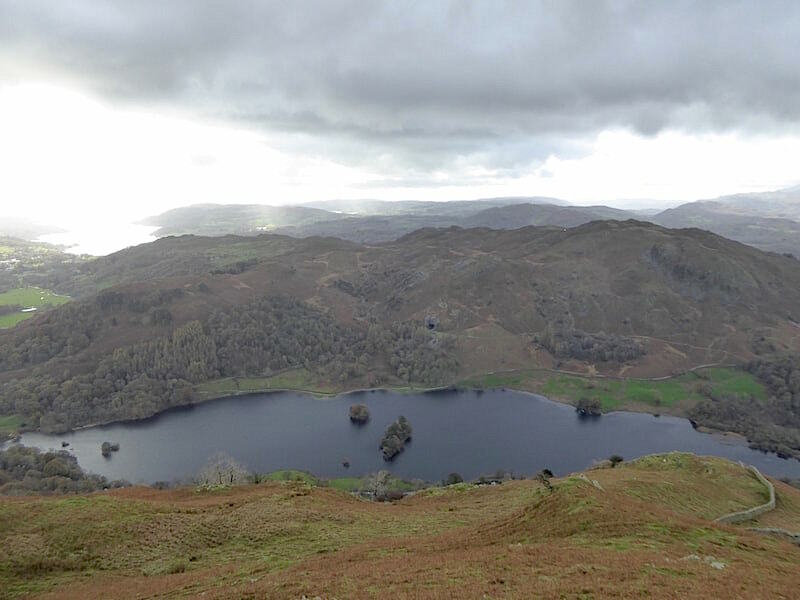 I can identify this though as I’m standing directly above Rydal Water and directly under a long line of chilly grey cloud. Meanwhile Windermere continues to gleam in the sunlight and dazzle the eyes, with Loughrigg opposite looking decidedly drab in comparison. 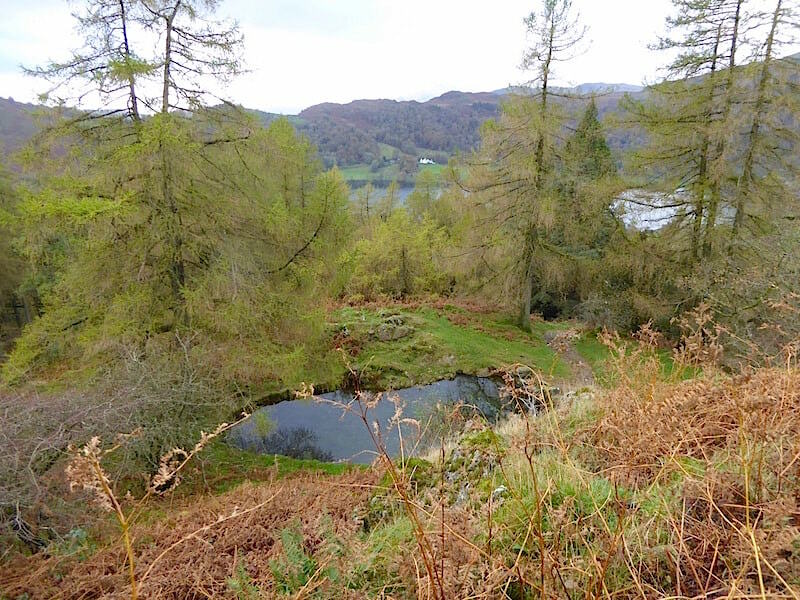 The black dot in the centre of the shot isn’t a mark on the camera lens its the entrance to the large quarry cave on Loughrigg. We’re planning on calling in at the cave later on so I hope things will have brightened up a bit by then. 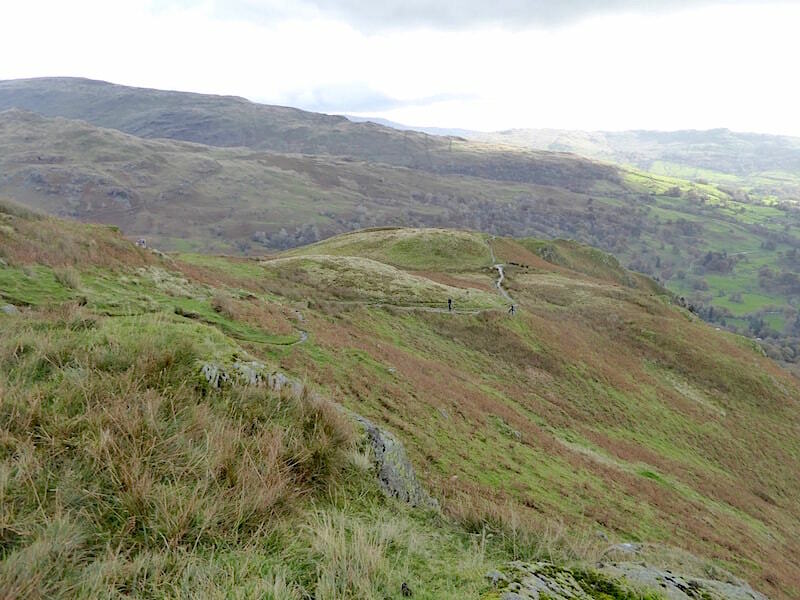 Making our way down Nab Scar and coming up a young man and his female companion. When passed by them further down I noticed how lightly dressed they were, t-shirts and trousers only, and toting extremely small backpacks, just about big enough for a lunch box and a couple of bottles/cans of drinks. I couldn’t see anything by way of warm clothing either fastened around them or stuffed into their small packs, so if they were intending walking the horseshoe they were very lightly equipped to do so. Out of shot on the left, tucked away in a cluster of rocks a little higher up than us I noticed a young man who I assumed was taking a break and gaining some shelter from the wind as he did so. I didn’t pay him any more attention than that and more or less forgot about him until later on. Reaching more level ground I took a look back at this part of our descent. The young man and his female companion have now reached the point at which I took the previous photo and just to the right of them is the little rock crevice where the other young lad was taking shelter. The zoom on the camera showed that he was still sitting there, still having a break I thought. The gloom is still above us as we stop at another viewpoint to take in the views. 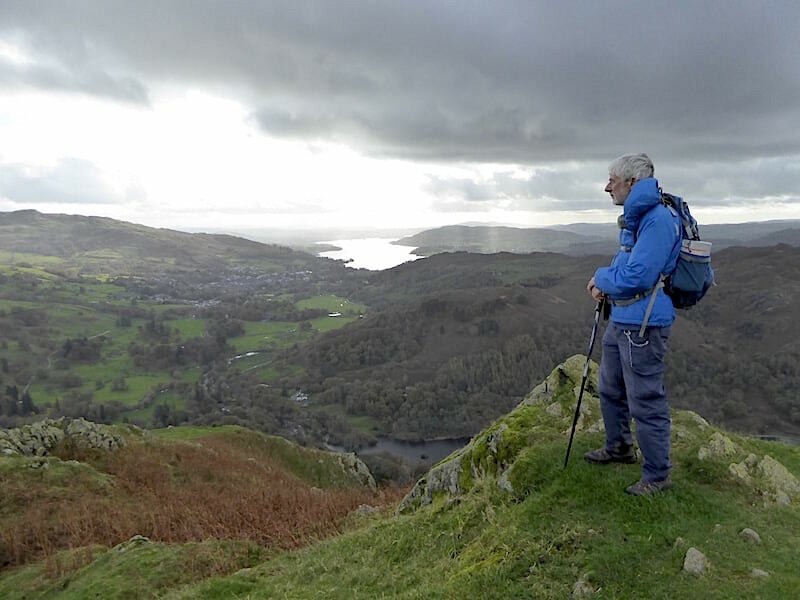 Am I annoyed and irritated by the fact that for the whole of the time since we reached the ridge Windermere has been basking, nay downright revelling, in more than its fair share of sunshine? You bet I am! As we stepped down from this high point and back onto the path we met a man toiling up towards us. 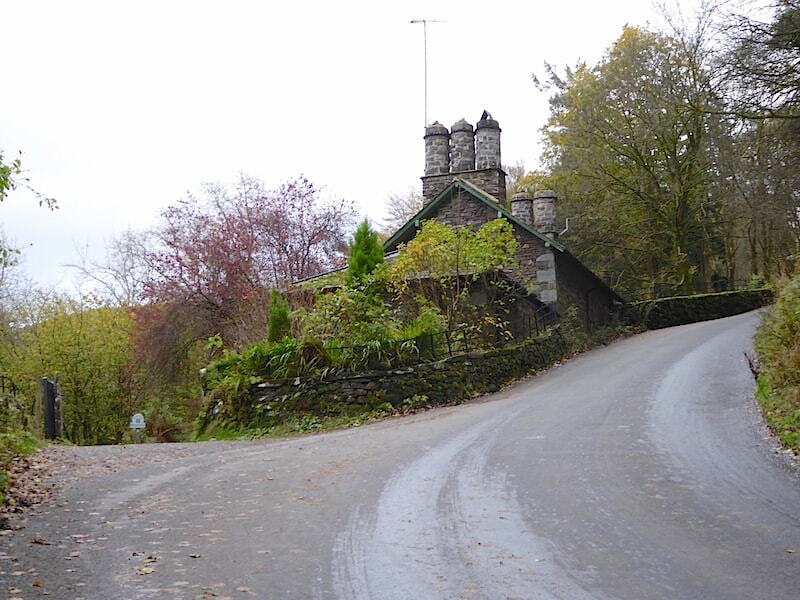 He stopped when he saw us and when he’d got his breath back he asked us if we had seen a young lad of sixteen with dark hair wearing a black t-shirt further back up the path. 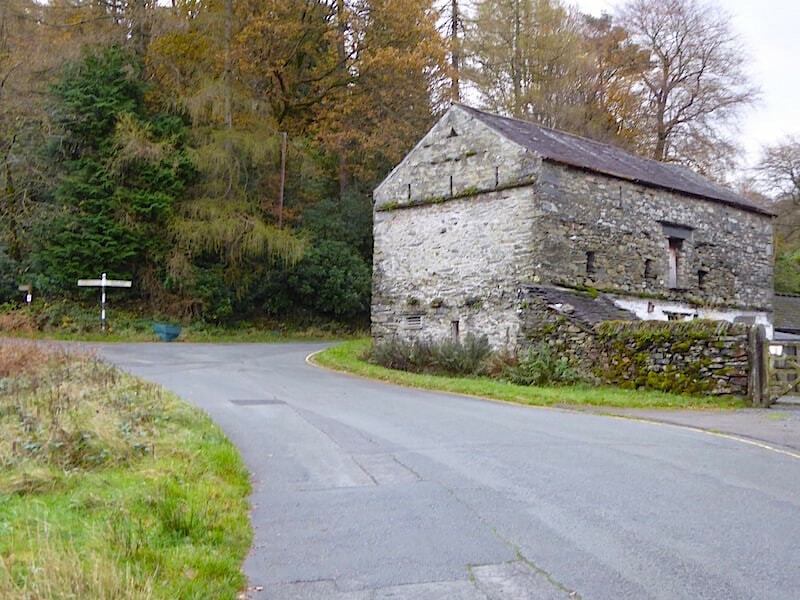 We had to scratch around in the memory box as so many people were walking up here today, but we both remembered the young lad with the female companion who was wearing a black t-shirt. Was he with a young lady we asked, not unless he’s got very lucky was the laughing reply. 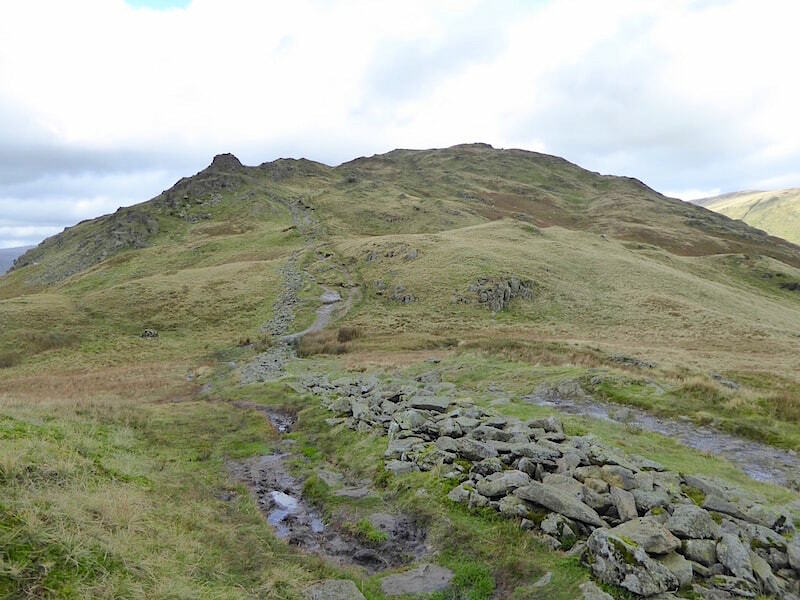 The young man in question was this walker’s son who had become impatient with the rest of the family’s pace up Nab Scar and had gone on ahead. 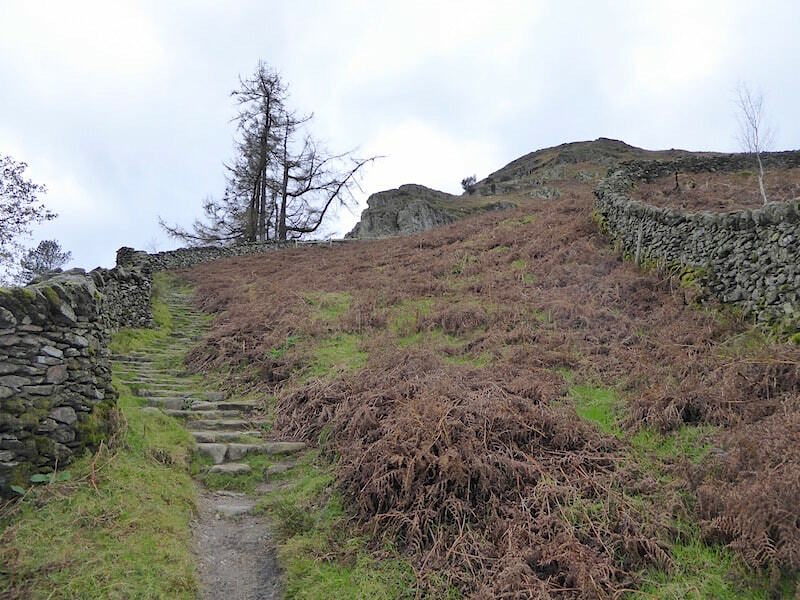 Meanwhile Dad’s young daughter had experienced an attack of vertigo lower down the steep path and Mum had stayed with her until she felt able to carry on. So there was Dad stuck between the two halves of his family and hoping his son hadn’t gone too far ahead for the rest of them to be able to catch up. As we parted company and continued down I remembered about the young lad sitting in the rock crevice, also with black hair and black t-shirt so we shouted back to the dad who, at just the same moment, had spotted his son who was standing up and waving some way ahead of him. Relief all round especially when Mum and daughter suddenly appeared around a bend in the path below the three of us. With three quarters of the family back together again they set off to join the fourth one and get on their way again. I asked Dad if they were walking the horseshoe and apparently that had been the plan but by now he had doubts that they would actually complete it so let’s hope that the rest of their day was enjoyable wherever they went. 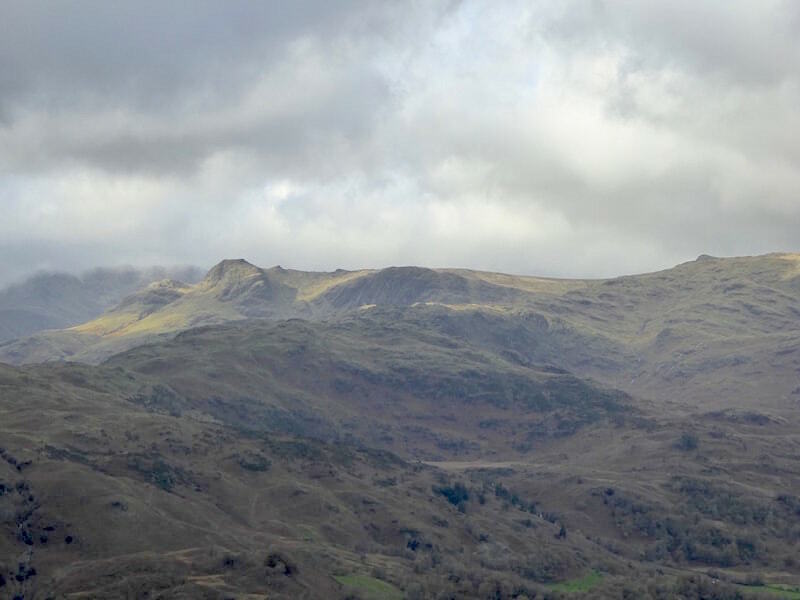 As well as Windermere the Dove Crag to High Pike ridge has also been hogging a good bit of sunshine for quite a while now too and, as if to rub salt into the wound, all that blue sky is over in the east where we live. 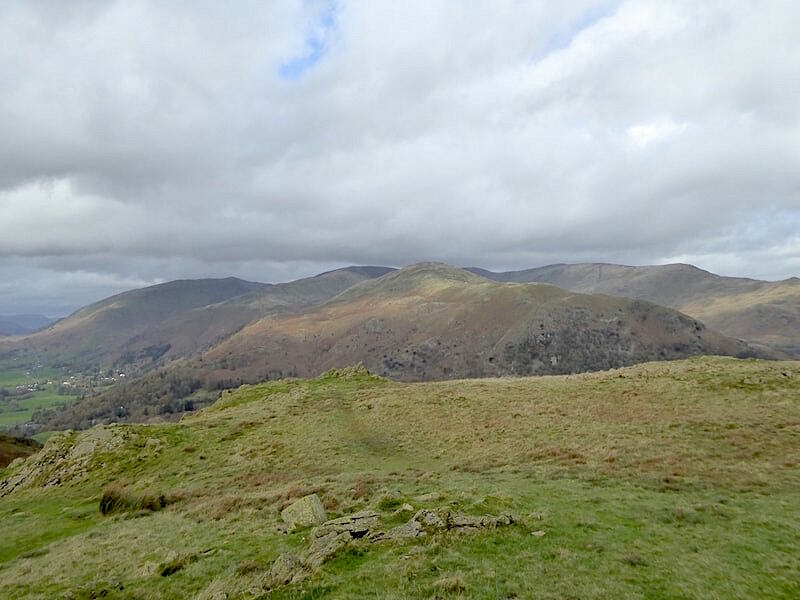 Perhaps we could have been walking in the sun over some of the far eastern fells instead. Oh well, you win some, you lose some. 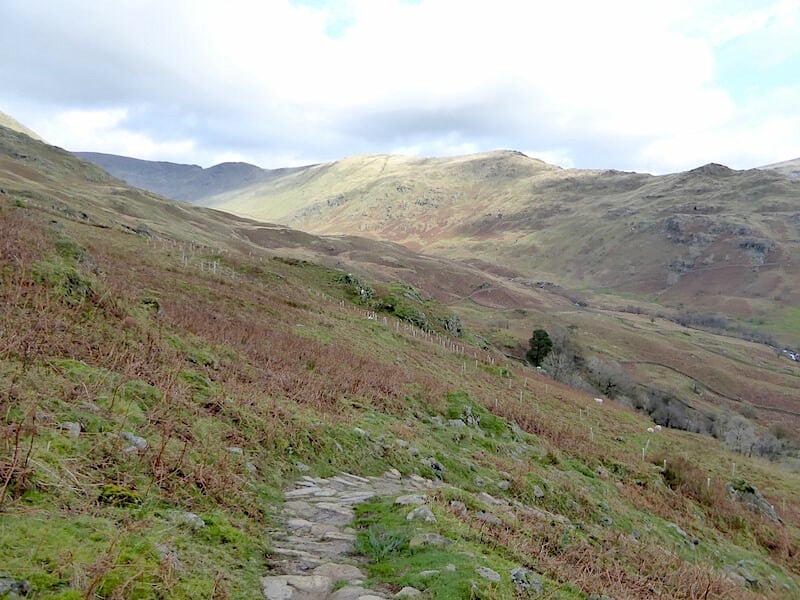 Still making our way down the path to Rydal Mount and High Pike is still hogging the sunshine …..
….. and we are still under that heavy cloud. 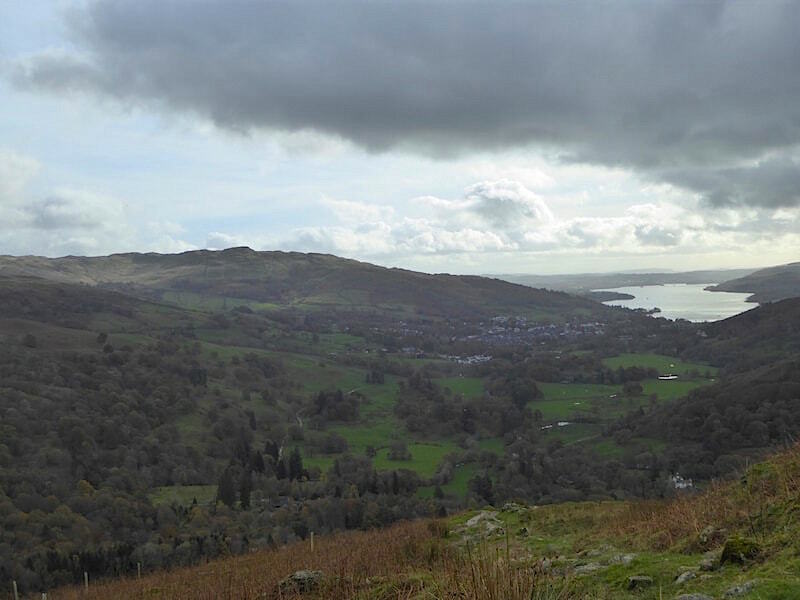 Even Windermere has lost its shine now and you can just about make out the town of Ambleside on its shores beyond the green fields. 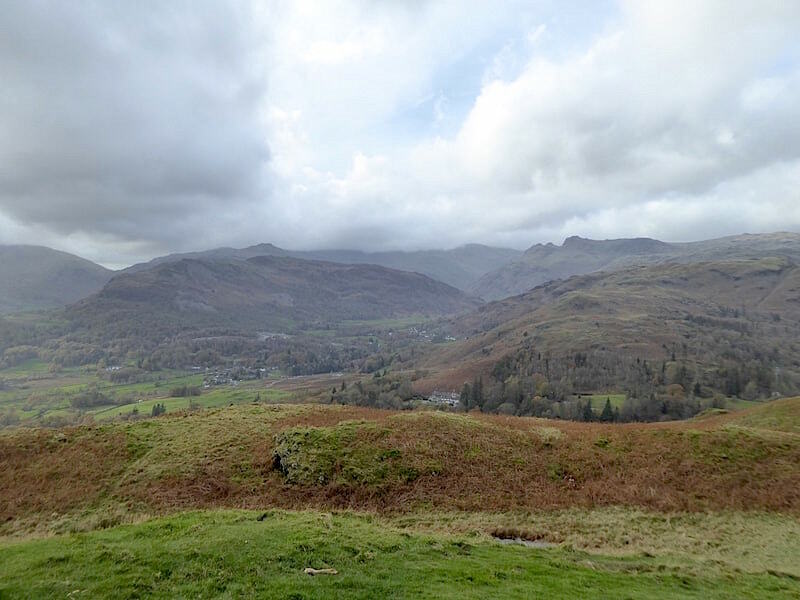 We’re almost down off Nab Scar now and about to join the lane down to Rydal Mount so one last look back before we leave …..
….. and a quick look over to High Pike and Low Pike, now suffering the cloud cover, over on the eastern arm of the Fairfield Horseshoe. 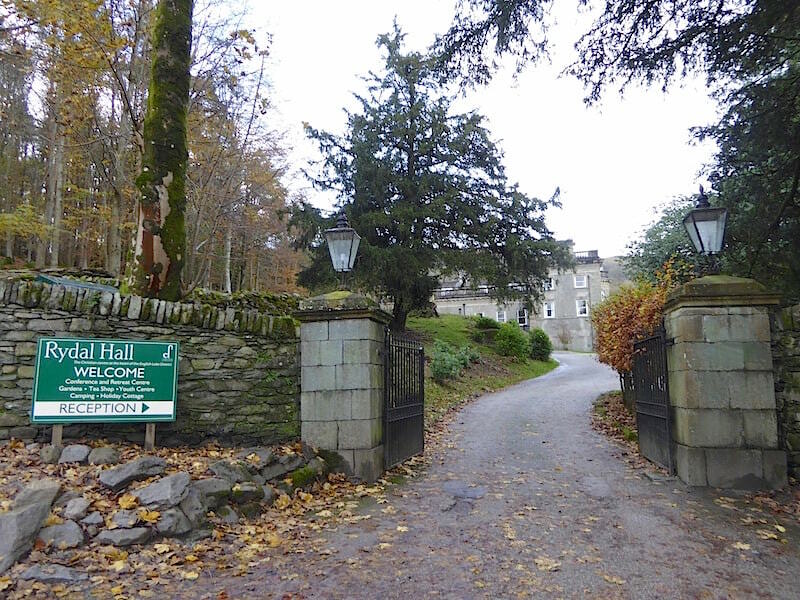 Making our way down Rydal Mount and passing by Rydal Hall. The hall is is owned and run by the Diocese of Carlisle and provides conference facilities, retreats, events, a youth centre and a variety of holiday accommodation both in the Hall and in the grounds. We didn’t have time to wander round the gardens and the woodlands today or for a quick nip into the tea shop so it was quick march down Rydal Mount to the A591 where the volume of traffic kept us waiting for a couple of minutes before we could cross the road …..
….. and make the short stretch of road walking down to Pelter Bridge beneath which the River Rothay was in full flow with the water level very close to overflowing the banks in quite a few places. The usual ice-cream van was in situ and, as the car parking areas were full and their occupants wandering around keeping tabs on their children and dogs, it had a steady stream of customers. Grievous bodily harm inflicted on yet another tree, high on the suspect list are Ophelia and Brian both of whom have vanished into thin air. 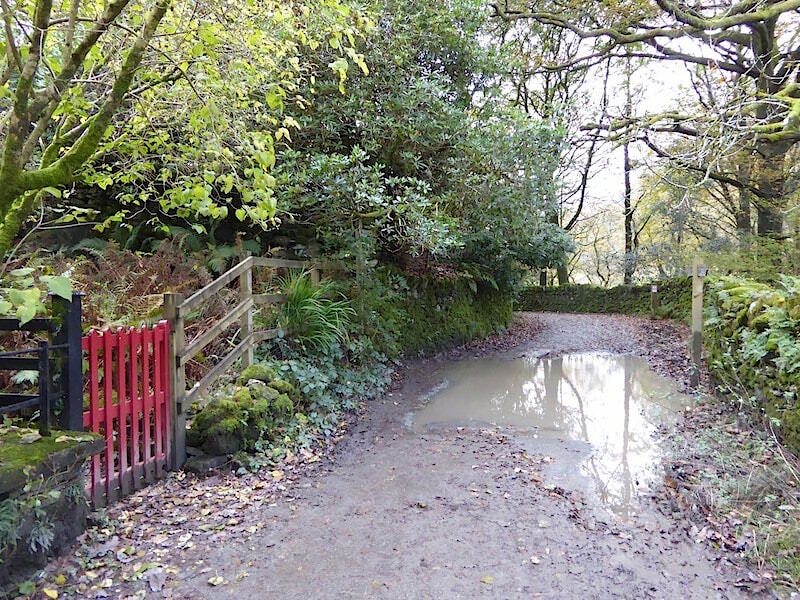 Not a shot included for its artistic or aesthetic qualities but simply to illustrate the very puddly conditions along the path to Rydal Water. 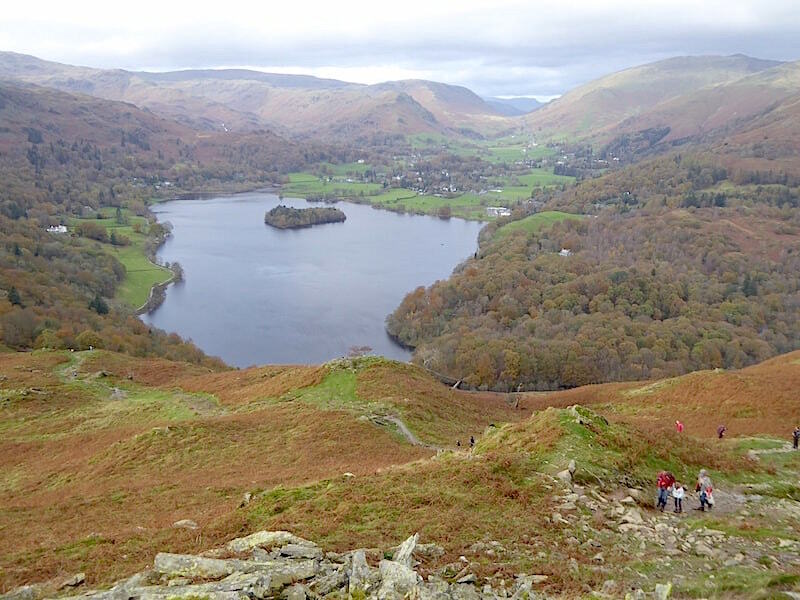 Rydal Water from the upper path with dozens and dozens of folk on this and the lower path and the merest hint of sunshine appearing somewhere above us. Yes, its definitely a splash of sun as we look across the water to Nab Scar, it didn’t last long but it was very welcome while it was there. Sun or no sun, the dog in the bottom left hand corner of the shot was enjoying his stick retrieving game. A hastily grabbed shot at the quarry cave. I had waited a while until a tribe of cave dwellers decided to come out for some fresh air and, just as the last of them had passed across and I crouched down to take the shot, the bloke up ahead started running straight across in front of me. In complete contrast a lady behind me told her young son just to wait a minute because this lady (me) was taking a photograph. I hope the young lad grows up to be as considerate of others as his mother was and nothing like the bloke over there. 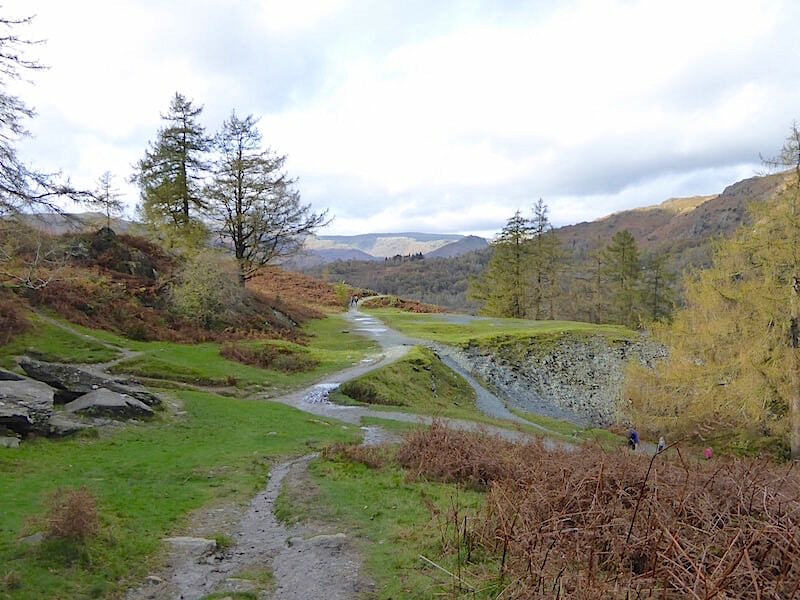 We retreated hastily and left the crowds at the cave to enjoy each other’s company while we took this path to carry on walking up to Loughrigg summit. 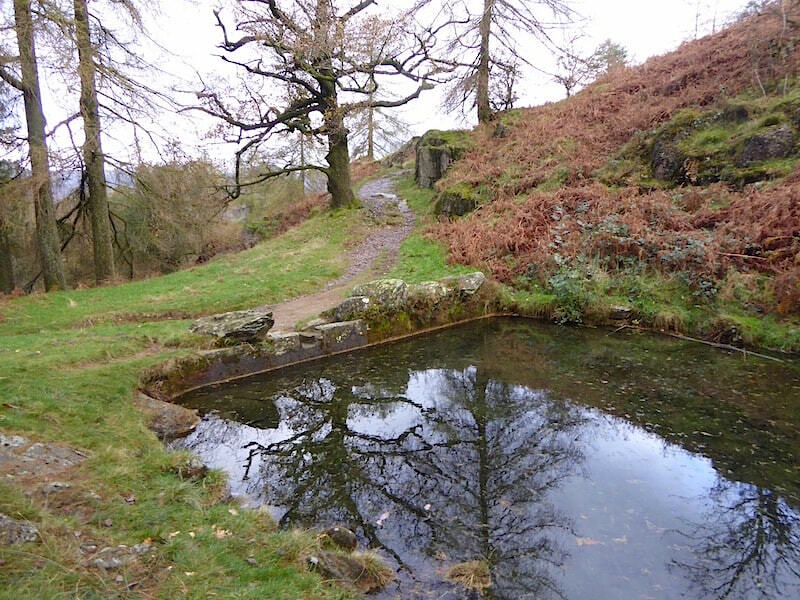 The quarry cave is out of shot at the top of the path going up to the left, and the path going straight ahead continues on above Rydal Water towards Grasmere. 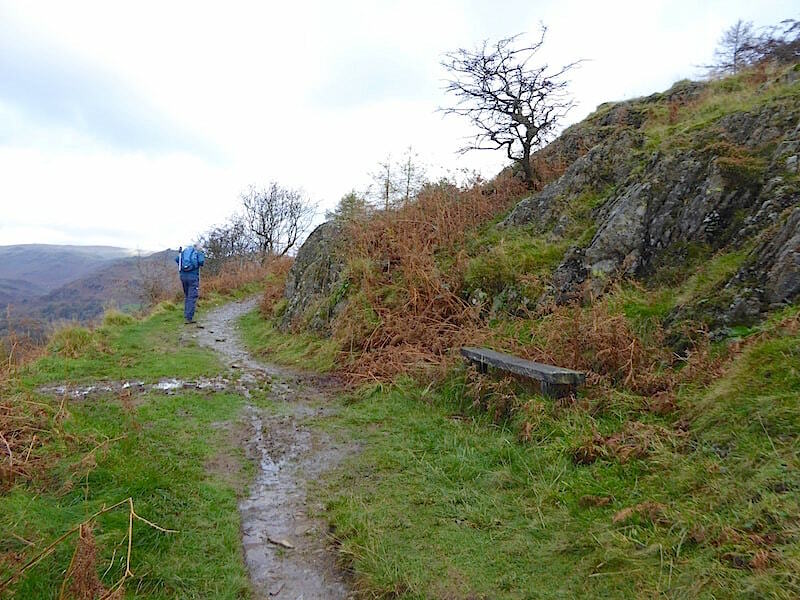 We turn around and carry on up the path …..
….. which can only be described as wet, wet, wet! Progress can be very slow when you hit on stuff like this, all you can do is keep calm and keep carrying on. 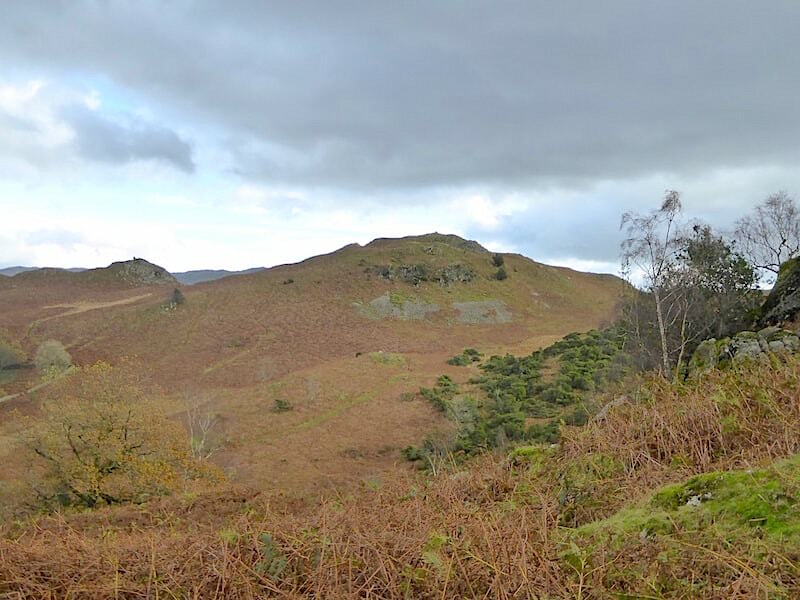 A pause in our exertions in the mud bath for a look over to our left for this view of Lanty Scar, which is just one of the many lower tops which are part and parcel of the whole of Loughrigg Fell. Now this is much better, and the whole place comes to life and simply glows as the long awaited sunshine finally breaks through for a few minutes. Further along, and in another faint glow of sunshine, we reach the boggy area of Scartufts. Boggy it may be but at least the grassy path was nowhere near as squelchy along here as it had been lower down, for which we were truly thankful. 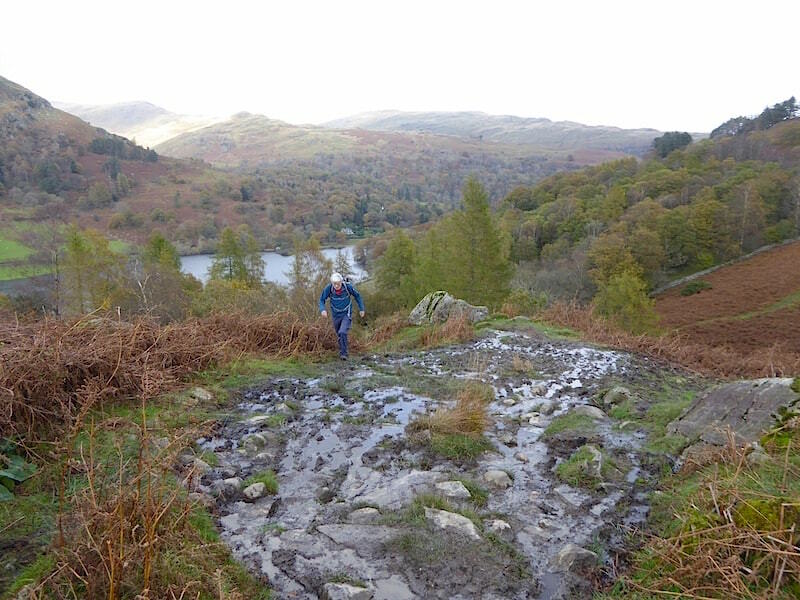 Looking ahead at the steep climb coming up as we continue across the Scartufts depression with its many puddles, pools and tarns …..
….. and looking back at Lanty Scar across Scartufts from the steep and very wet, as in running with water wet, climb. 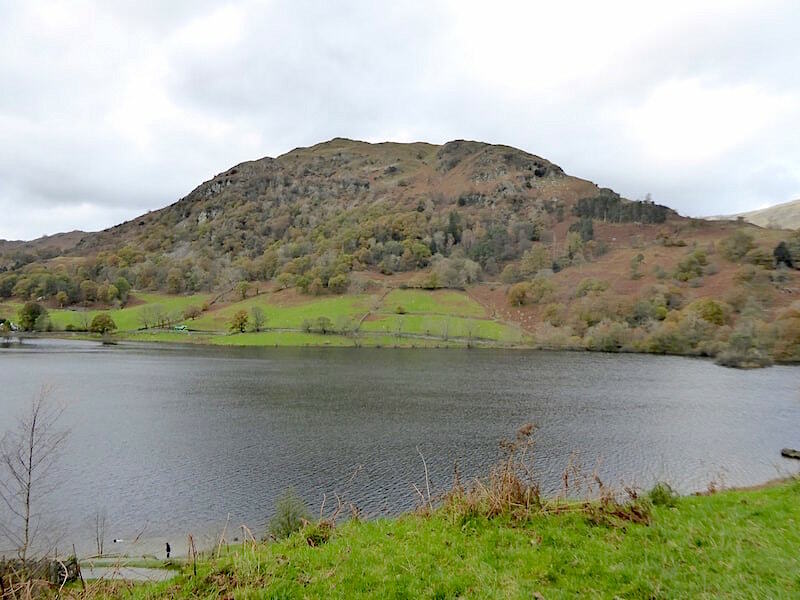 Although Loughrigg, standing at just under 1100′, is not very high it does spread itself out quite a bit with a multitude of paths going in all directions. 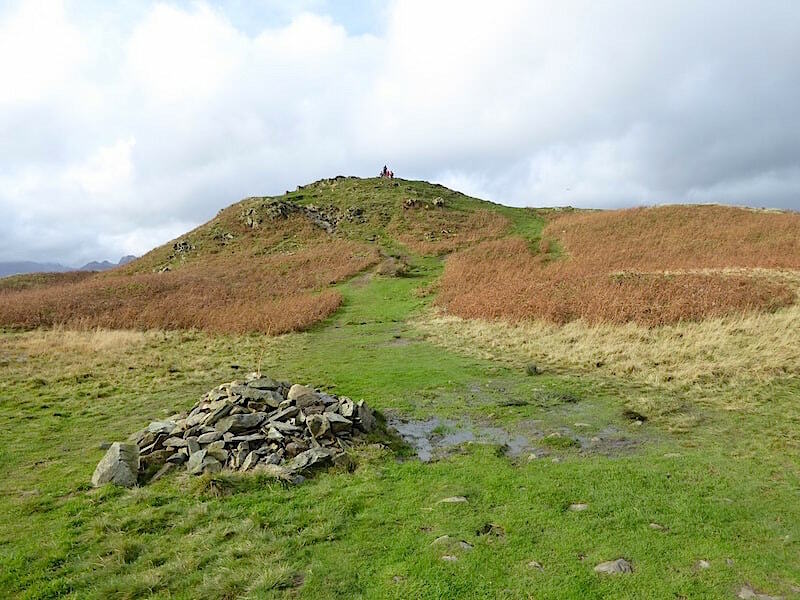 As they criss-cross each other all over the fell they can often lead the casual and/or unwary visitor on a merry dance. 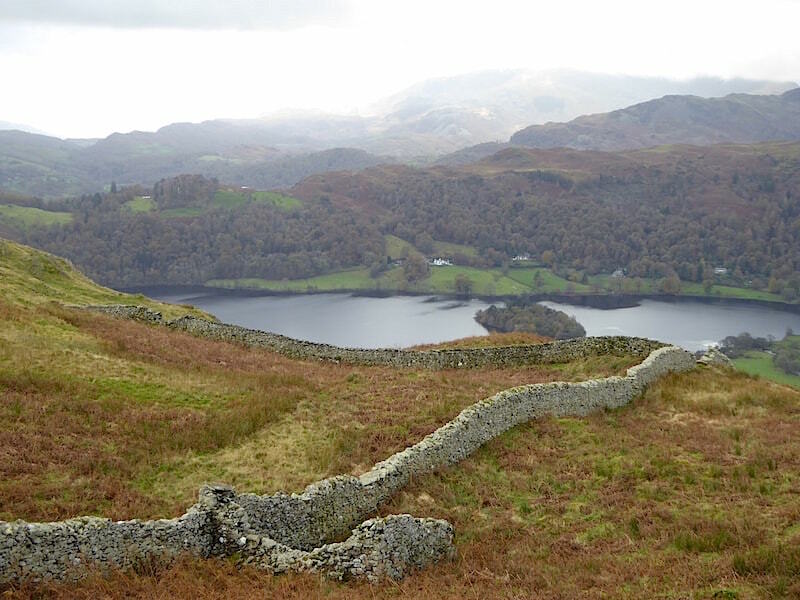 Loughrigg can definitely give Hampton Court Maze a good run for its money. 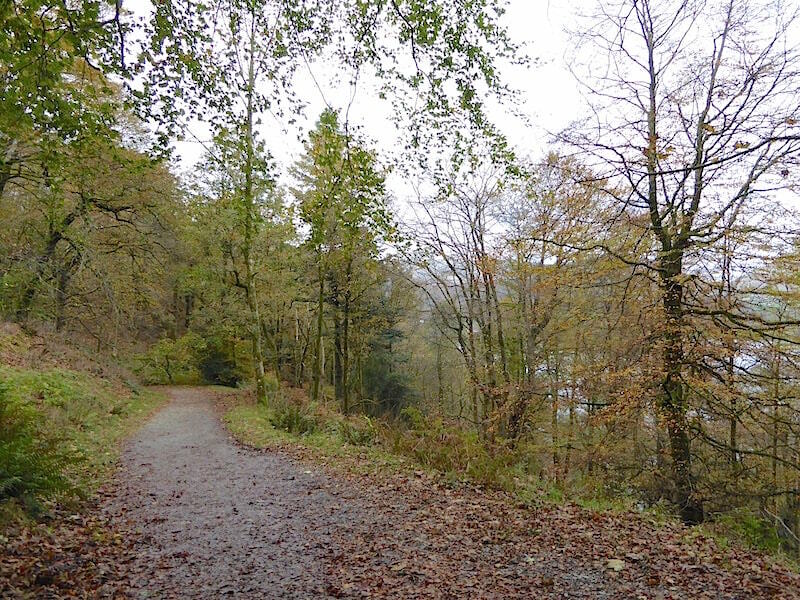 As we reach the crest of the watery path it leads us on to the junction with the path ahead. 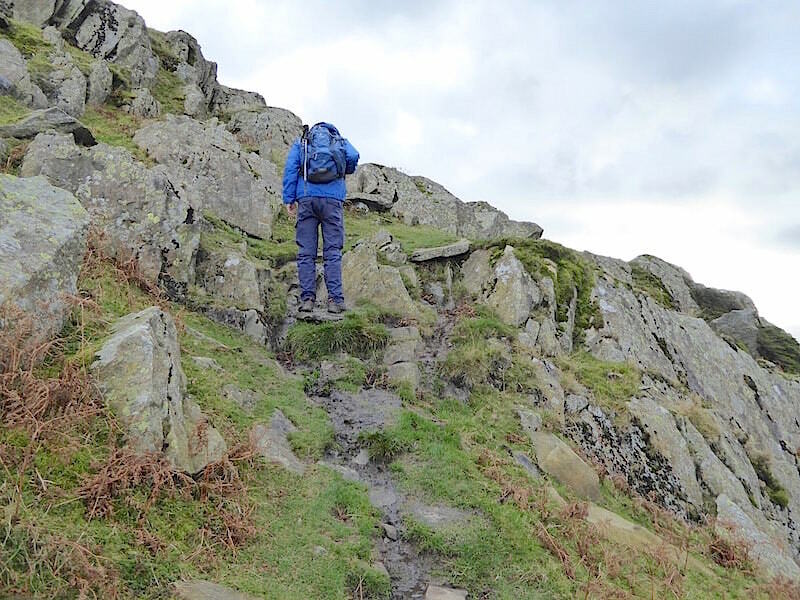 Here we take a right turn and head up the final section of the steeply pitched path towards the summit. We even have a glimmer of misty sunlight to cheer us on our way. The misty glimmer developed into full blown sunlight as we reached to top of the path and took a look down as a couple of other walkers made their way towards us. 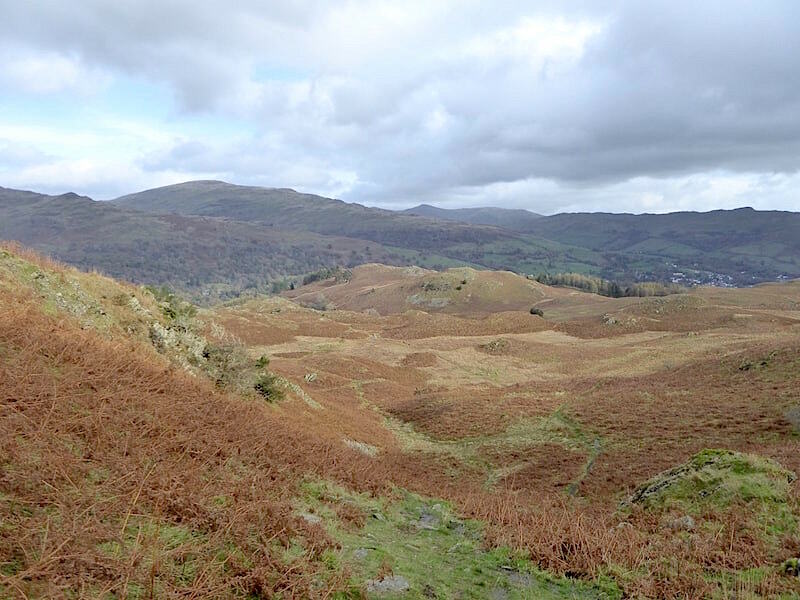 Behind them is the undulating and often confusing nature of Loughrigg Fell and when the bracken is at full throttle it becomes even more confusing, woe betide any parents who lose sight of their small children up here in summer! I bet you could spend a whole day up here and not walk the same path twice. 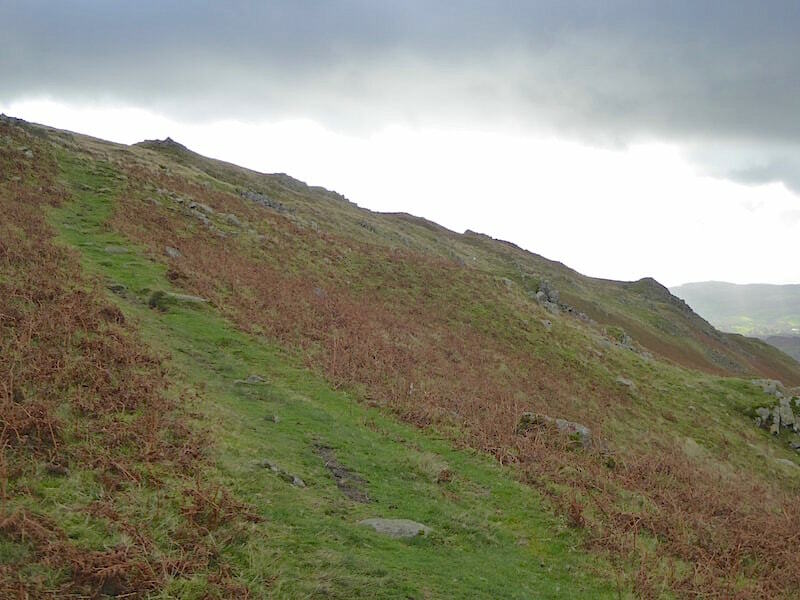 From the top of the pitched path the view immediately ahead is that of the trig column on Loughrigg summit where you would have to be here at the crack of dawn to have the chance of having the summit entirely to yourself, and even then I wouldn’t bank on it. 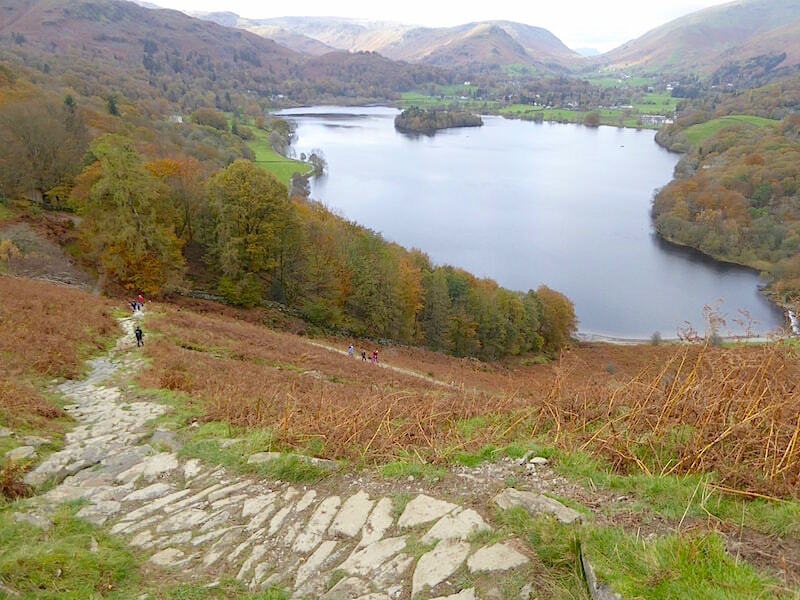 On the far side of the summit is a more popular path which begins at the Grasmere end of Loughrigg Terrace. We’re planning to descend using that path but chose not to use it for our ascent simply because it is generally very busy. 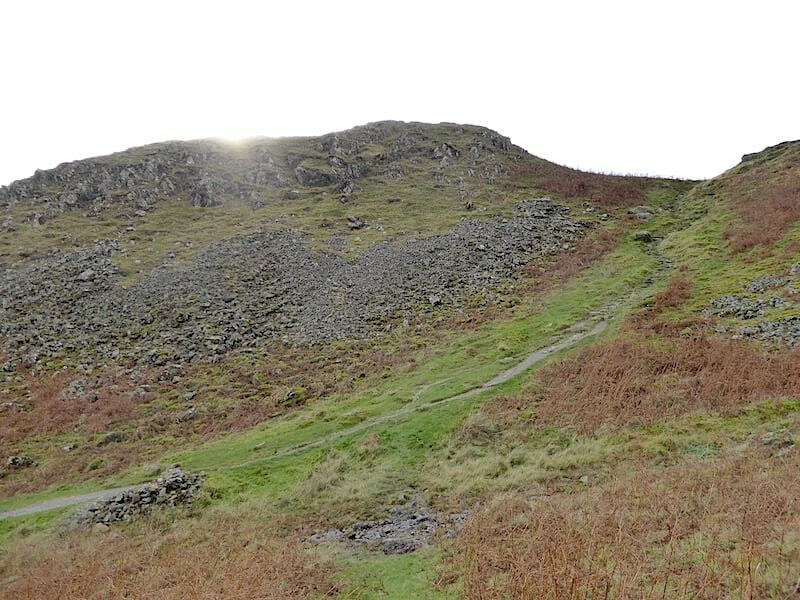 We saw no-one on the ascent route we used today. 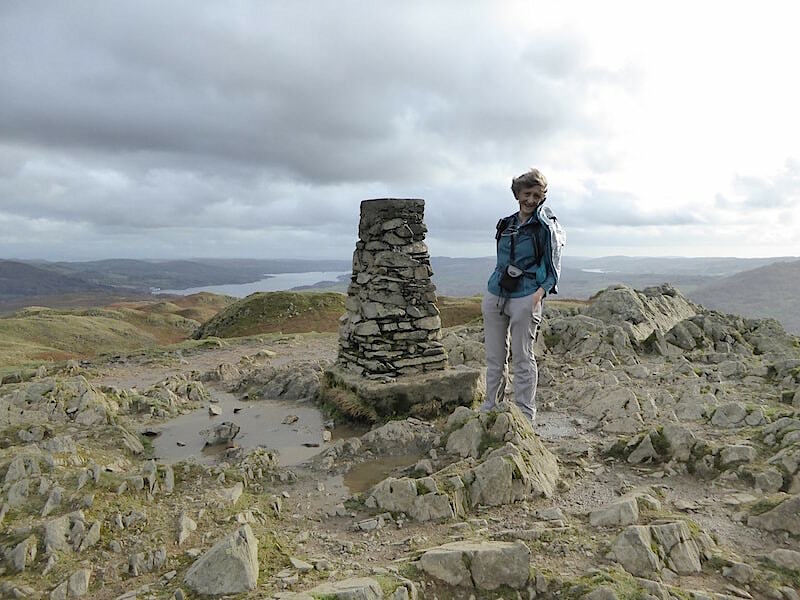 For such a lowly fell the views from the summit are extensive and on a better weather day quite spectacular. As things are its a bit like peering through drizzle on a steamed up kitchen window and, as these things do, a song from several aeons ago came to mind although I paraphrased the words of it as I thought about it. Anyone remember ‘I can see clearly now the rain has gone’ by Johnny Nash? No perhaps not, you’re all probably far too young. 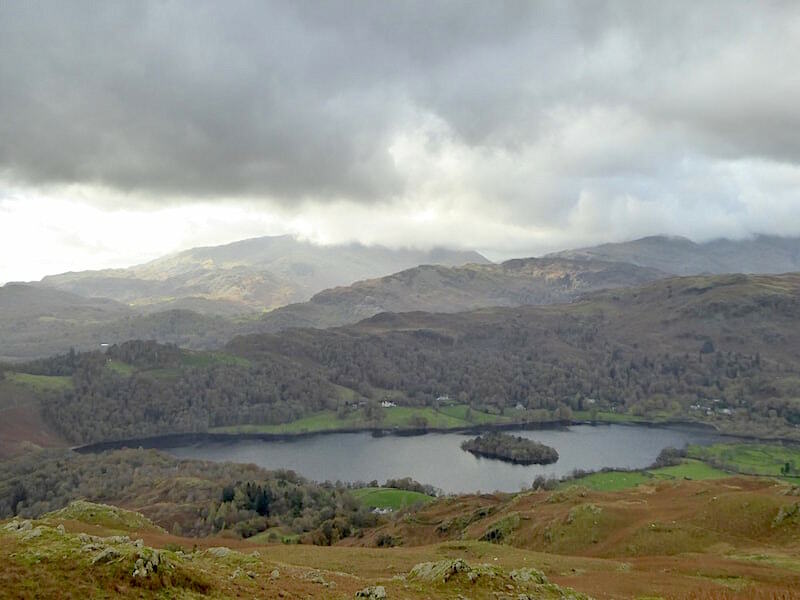 Anyway, the rain may have gone for today but we still can’t see anything very clearly although we do have a view of Elterwater, over to the left, with Wetherlam behind the water and Lingmoor Fell to the right of Wetherlam. The summit visitors had left when we made our way over to the trig column, so here I am in splendid isolation with the breeze hustling me from the west. We weren’t alone for any longer than it took to take the shot and I hadn’t even begun to move away when, from behind me, up popped a solo female walker who asked me in very broken English if I would take her photo standing by the column. Having done so she thanked me profusely and then went on her way. I did wonder why she hadn’t just taken a selfie since it was a smart phone she had handed me and then the penny dropped and I realised why. She didn’t have a selfie stick (or very, very long arms!) so she wouldn’t have got the full length shot that she wanted. Another steamed up window shot from the summit, this time a little further to the west where Lingmoor Fell is now to the left of centre, the Langdale Pikes popping up to the right of it and the added extra of a smidge of blue sky above them. 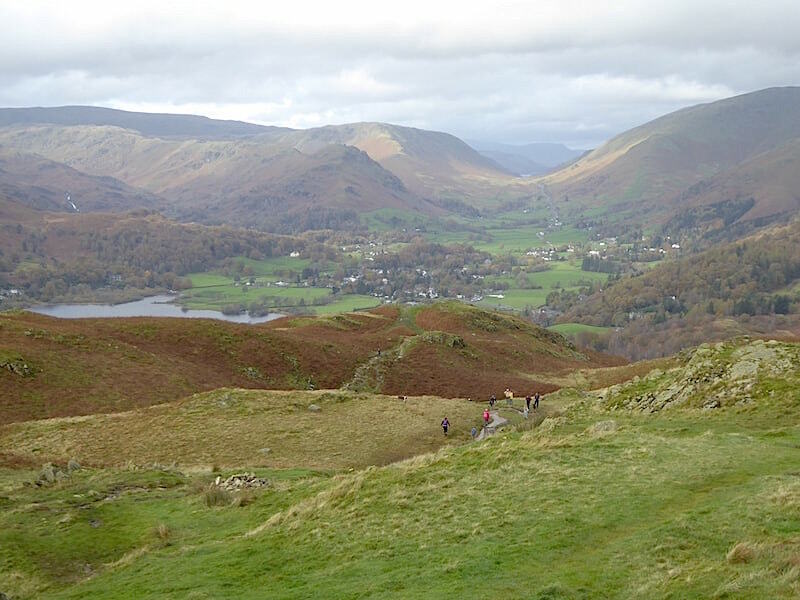 Things are rather brighter to the north where, beyond Grasmere village and Grasmere water, we can see Helm Crag and Steel Fell to the left, the U shaped gap of Dunmail Raise with a smidge of Thirlmere just above it, and then the Helvellyn range to the right of it. 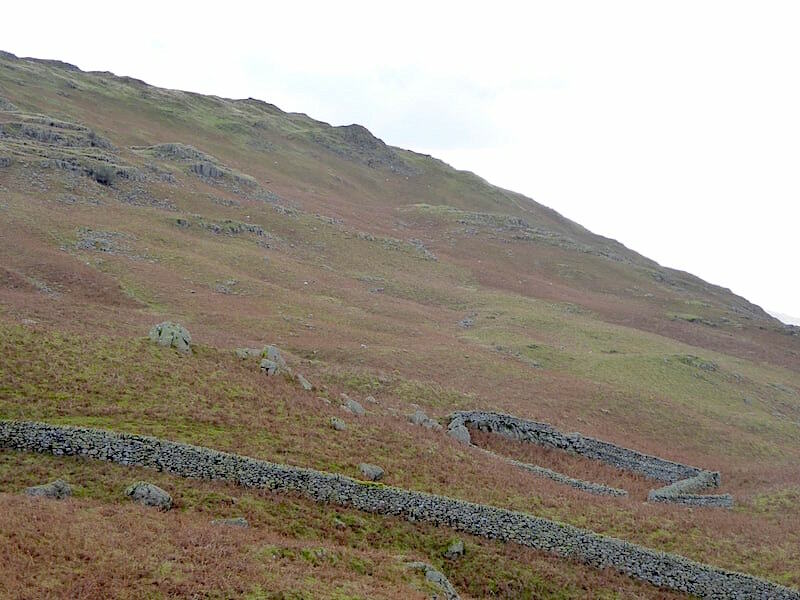 Below us is the very busy path bringing yet more walkers up to the summit. We begin making our way down so a last look back at the summit where Dad and his little kids were still having a great time, we could hear the shouting from here. We had another encounter with a parent here, a dad and his two lads pushing their mountain bikes up the path to this point where a flatter section gave them the chance for a rest and gave dad the opportunity to ask us for directions. They had reached this point from the terrace path, not in view in the shot because its hidden by the bracken between here and the lakeshore path. They were making for Little Langdale and dad wanted to know if they were on the right track. Well, in theory its possible but it would be a roundabout way to get there we told him. 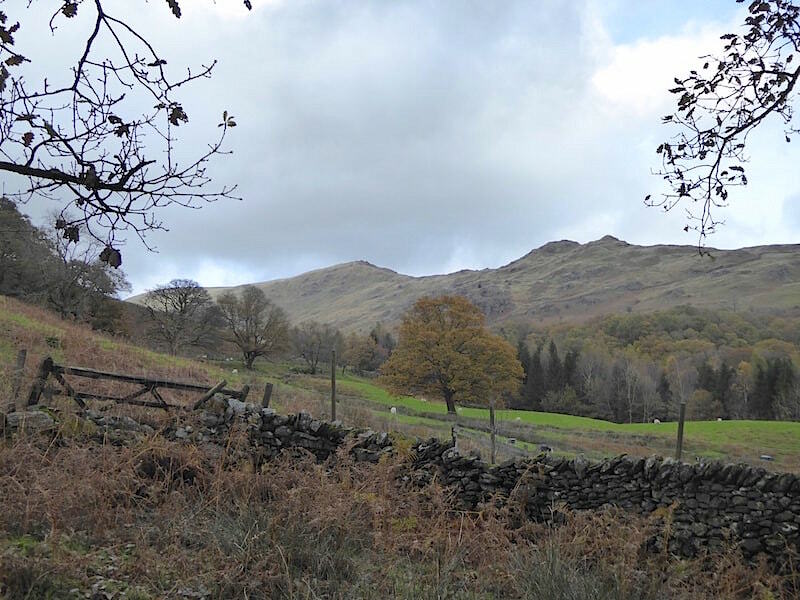 Out came the map so we could show him the quicker route, go back down to the path, turn left and follow the path until it joins the Red Bank Road, turn up left onto that road and continue on it over to Elterwater and then over into Little Langdale. With a rueful smile dad realised where things had gone awry and said that he would probably be hung, drawn and quartered for his error by his lads who by now were flopped on the grass and listening to every word. 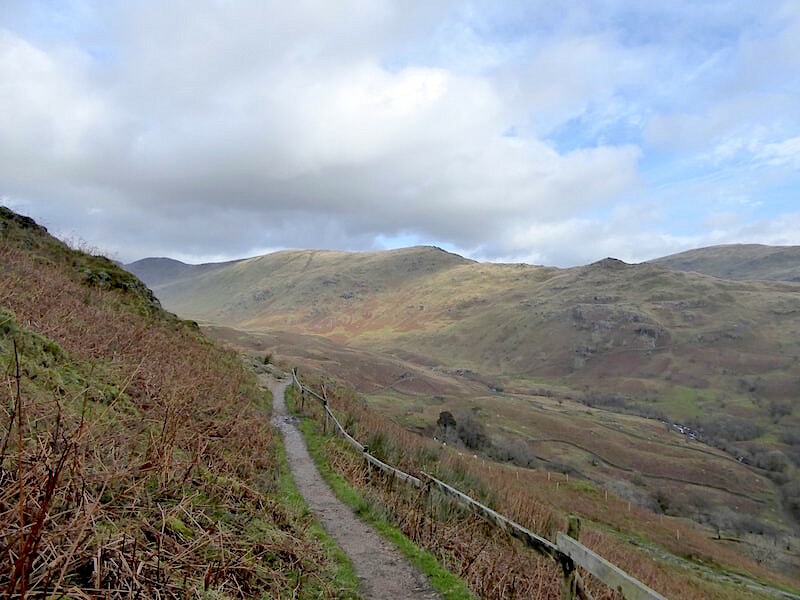 The alternative was to continue up to the summit, take a path going from there down western side to meet up with another back road, which they could follow for short way before taking a right turn onto another one which would also take them to Elterwater. Dad decided he would discuss it with the lads and see which option they wanted to take so, not wanting to watch the hanging, drawing and quartering, we left them to their discussion and went on our way. Not far to go now before we are down on the terrace path. 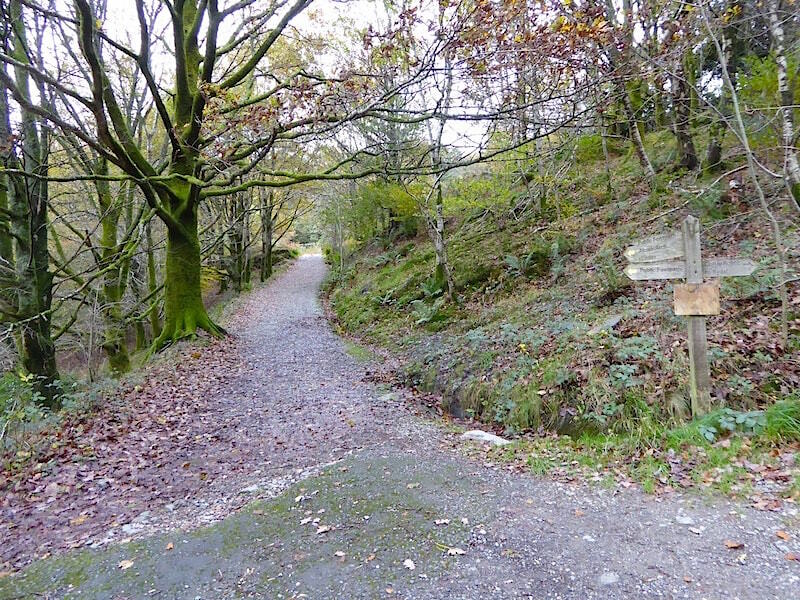 It was at the junction of these two paths that the afore-mentioned dad had turned up here instead of carrying on through the woods to join up with the Red Bank Road which comes down the hill to the left of the shot. 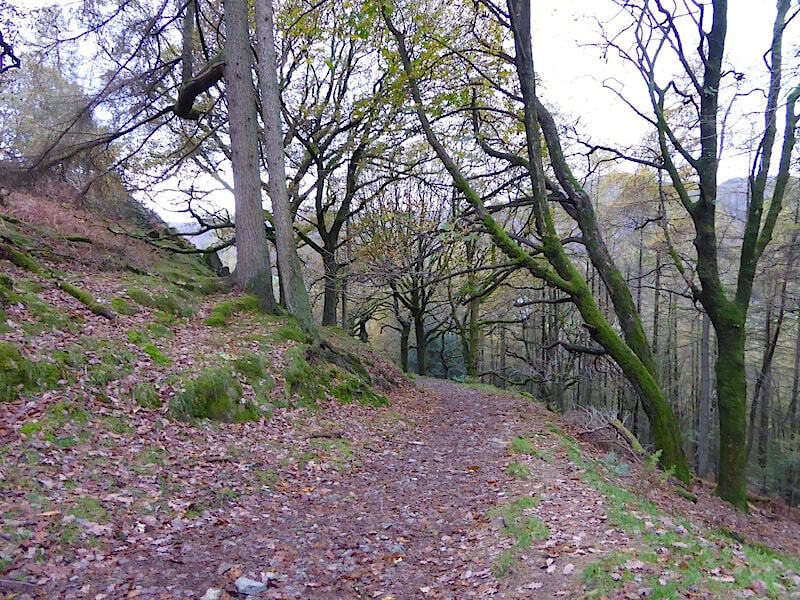 We had a very pleasant stroll along to Grasmere through Deerbolt Woods where quite a lot of the trees had been stripped of their leaves. The path tips us out onto Red Bank Road where we continue walking downhill, the mountain bikers would have needed to turn up for Elterwater at this point. I wondered which option they had decided to take. 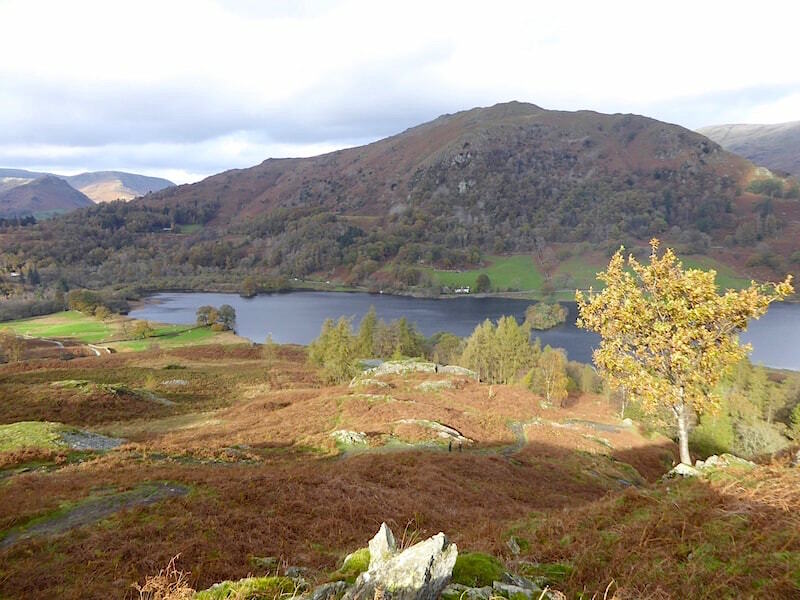 Flat and easy walking now as we follow the road back into Grasmere with a view of the western arm of the Fairfield Horseshoe across Grasmere. 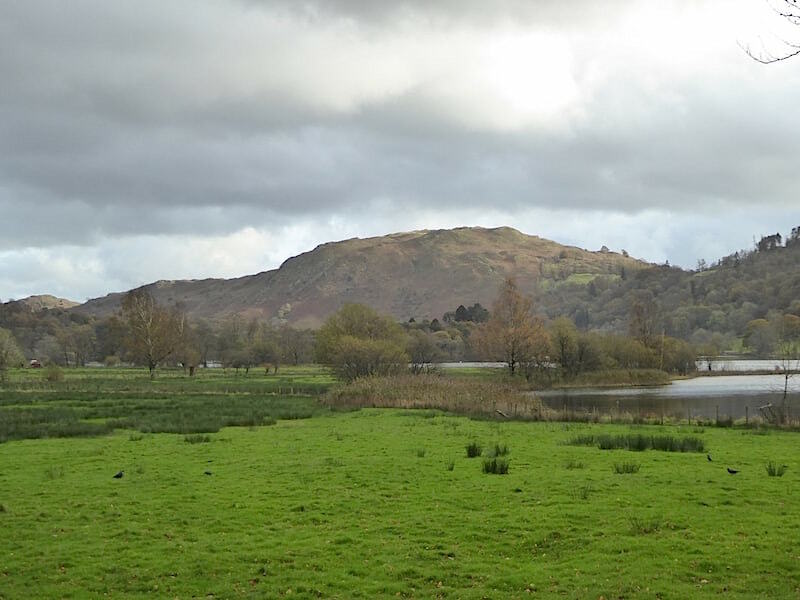 A hint of sun on Loughrigg as we passed the Faeryland Cafe, no fairies but tea and cake is available plus rowing boat hire. 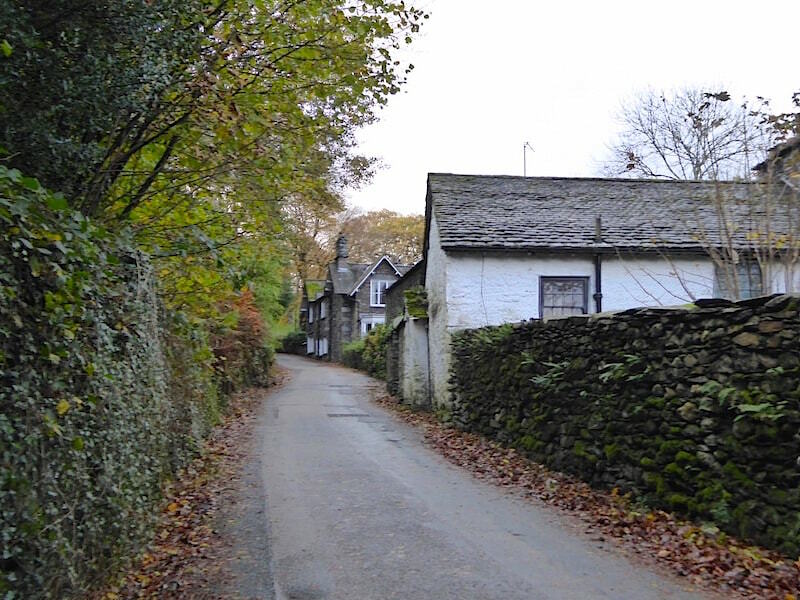 After a stroll through a very busy Grasmere village we were glad to leave it behind and begin making our way back to the lay-by. Seat Sandal and Stone Arthur now looking very dour beneath all the cloud. 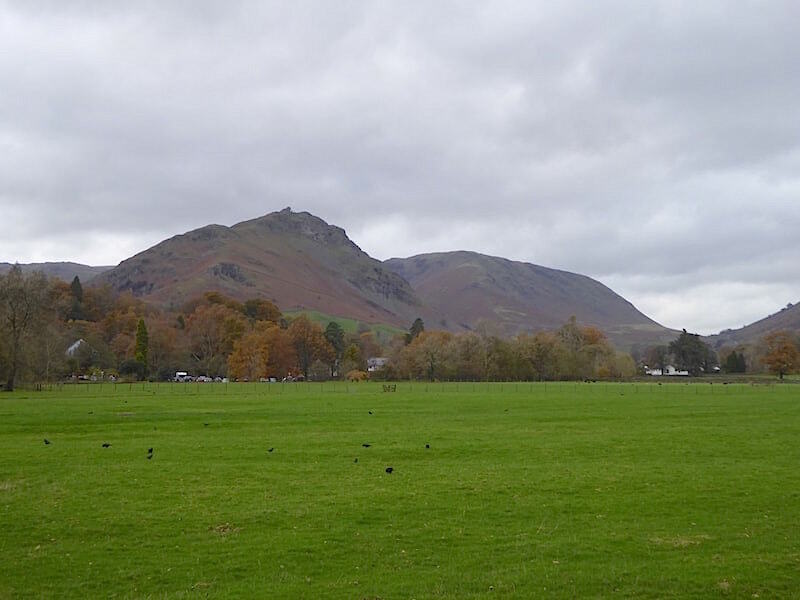 Helm Crag and Steel Fell looking equally dour as we crossed the field. The cloud cover is virtually total now with not a hint of sun anywhere to be seen. A last look at Stone Arthur as we walk the last few yards back to the still busy A591 and the lay-by on the other side of it. 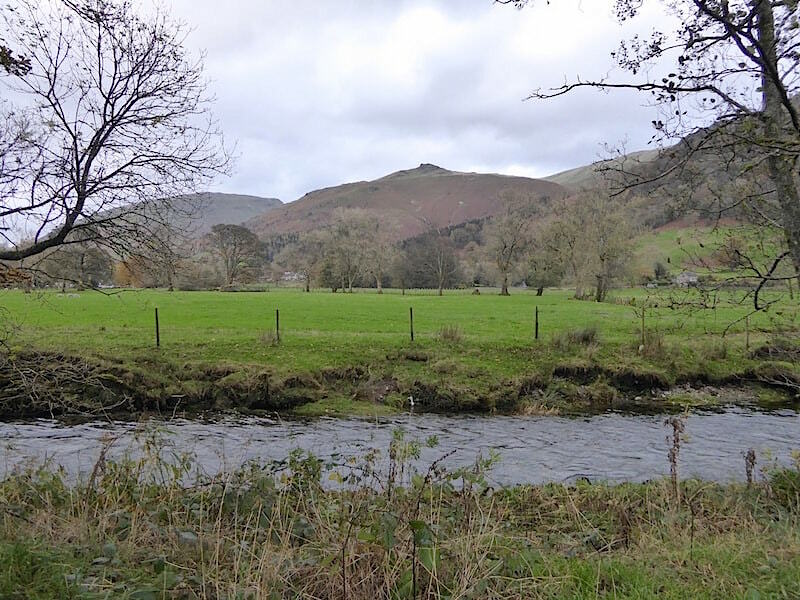 There were still a few cars left in the lay-by but most folks had gone back to their various bases after their assorted outings around and in Grasmere. Despite the gloomy conditions we’ve had a very varied and interesting day and an enjoyable one at that. So, now that the weather has turned sulky again we’d best get off home, whose turn is it to make the cup of tea?